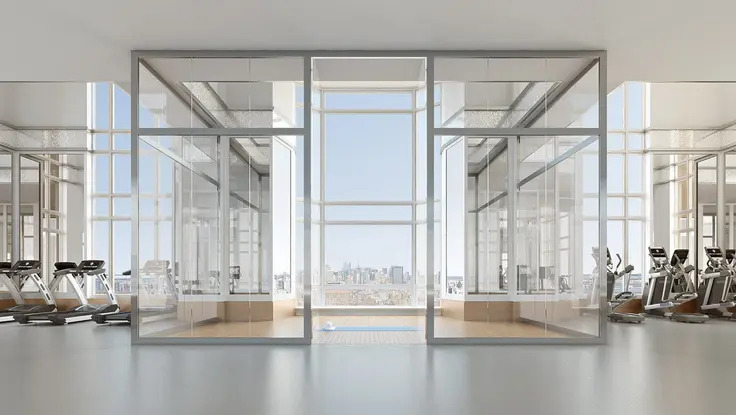 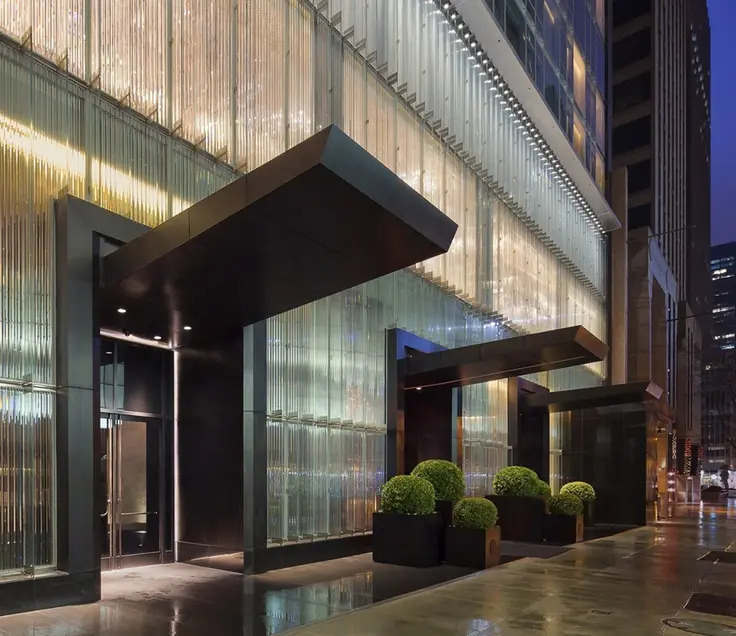 From the outside, the Baccarat is a 50-story, mixed-use tower at 20 West 53rd Street that looks like a tall, slim, mid-block tower on a low base. 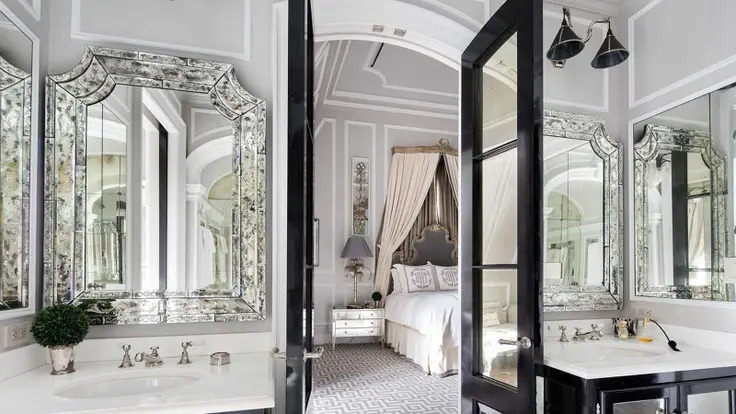 Its form is simple and a bit routine, but one should regard it, however, as a jewel case for its interiors are quite dazzling. 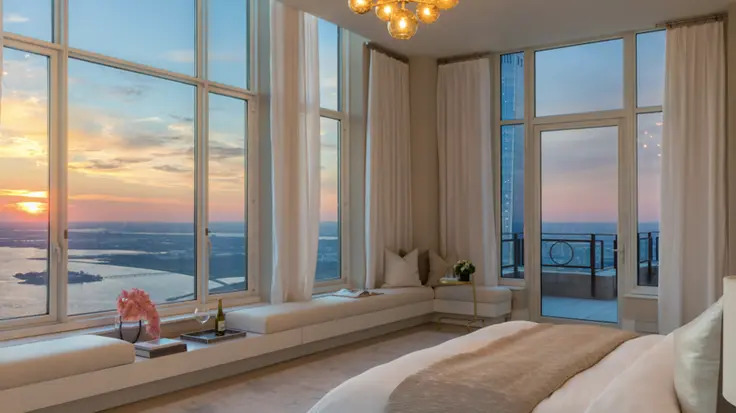 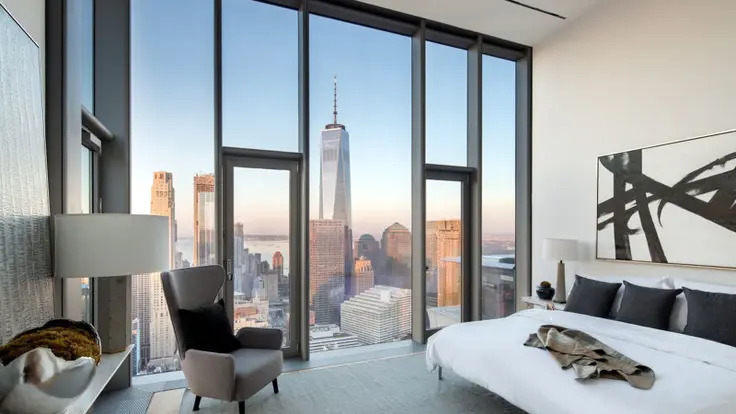 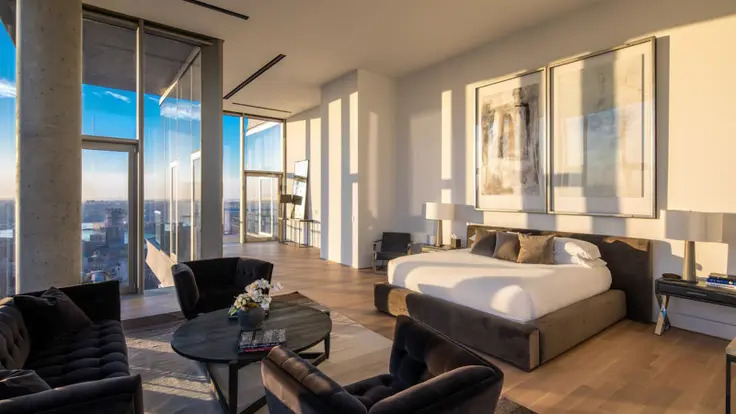 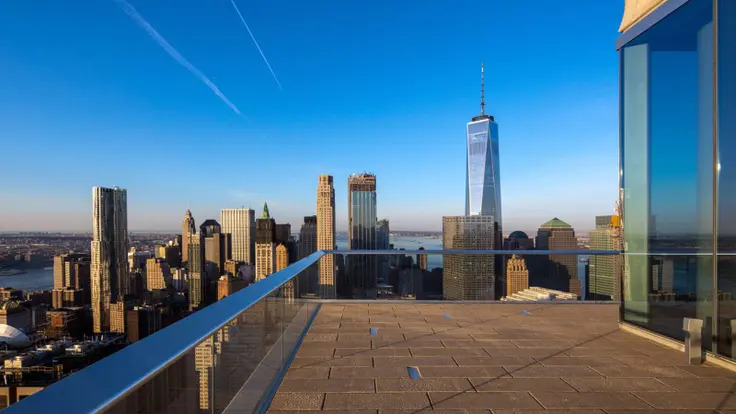 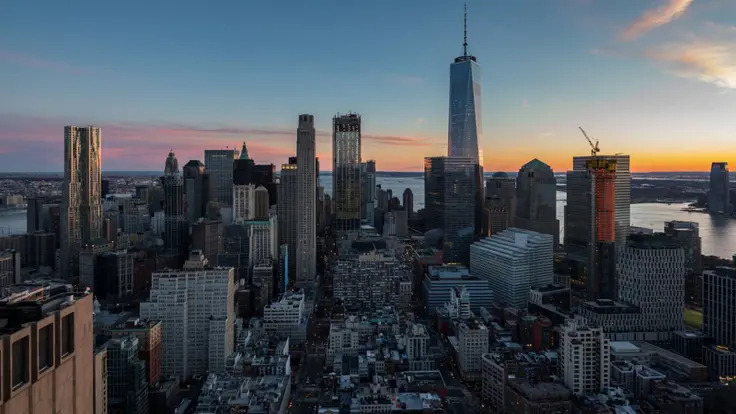 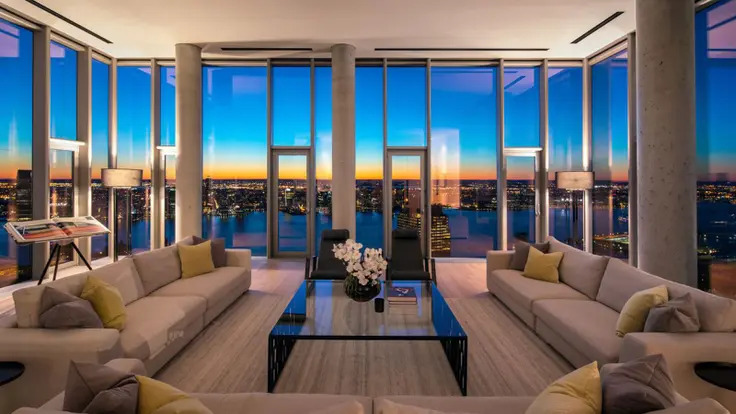 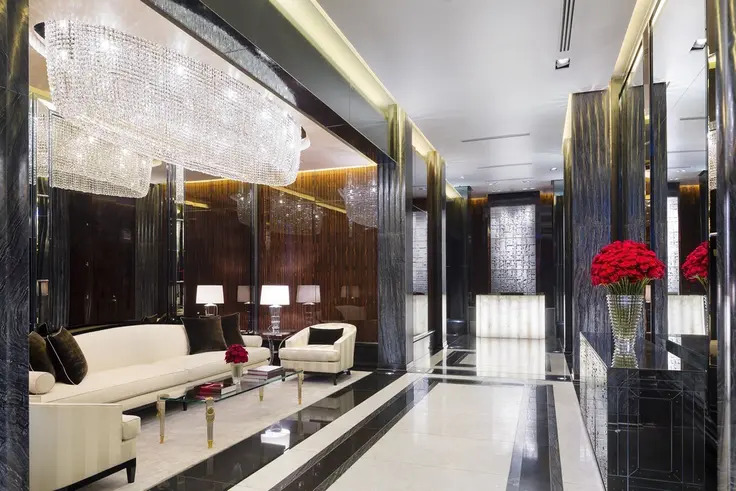 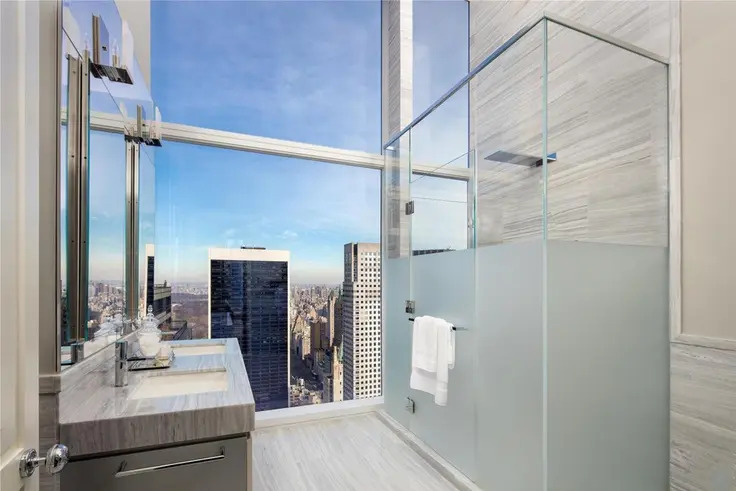 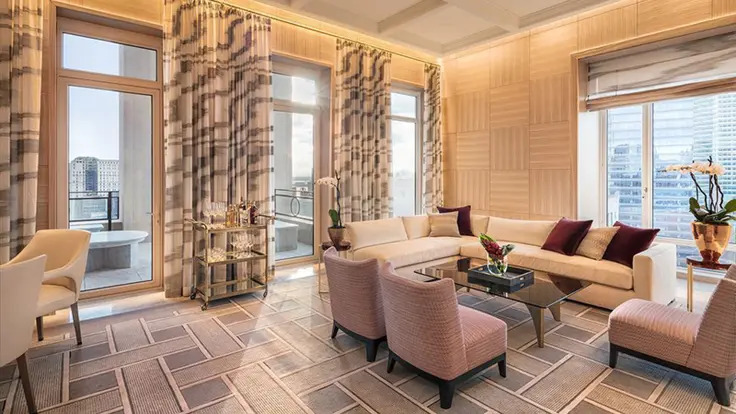 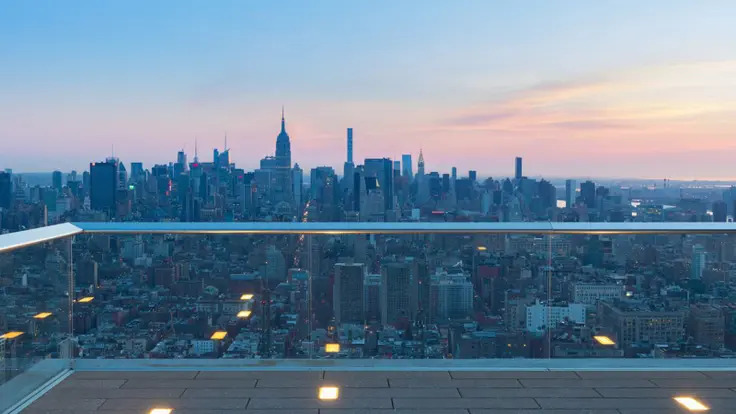 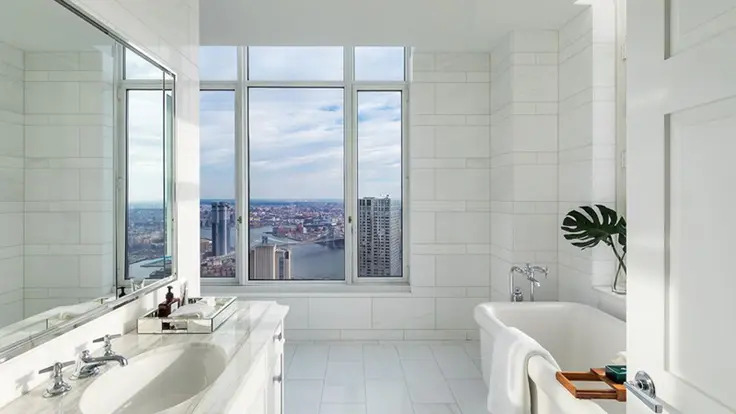 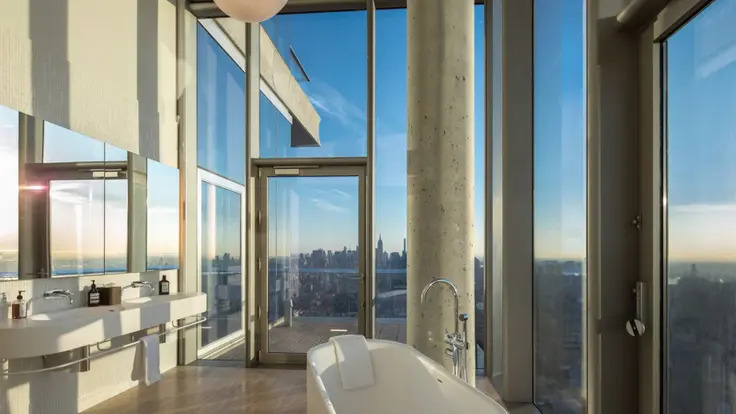 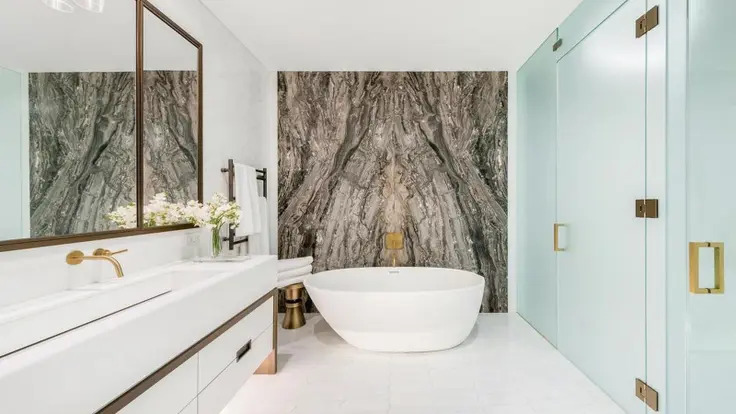 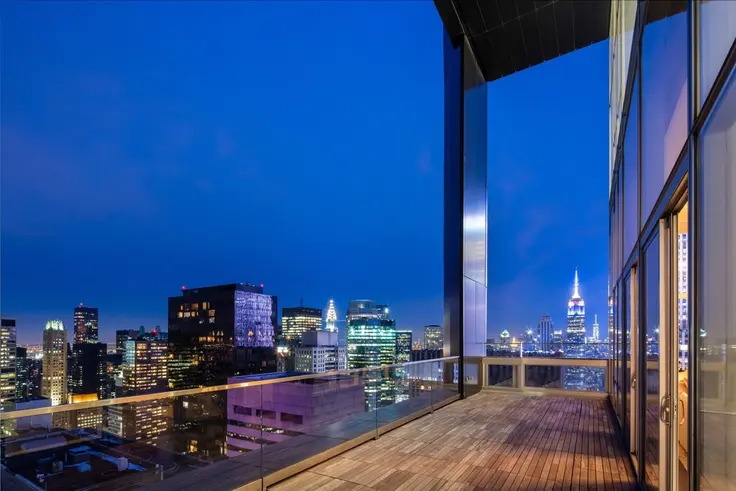 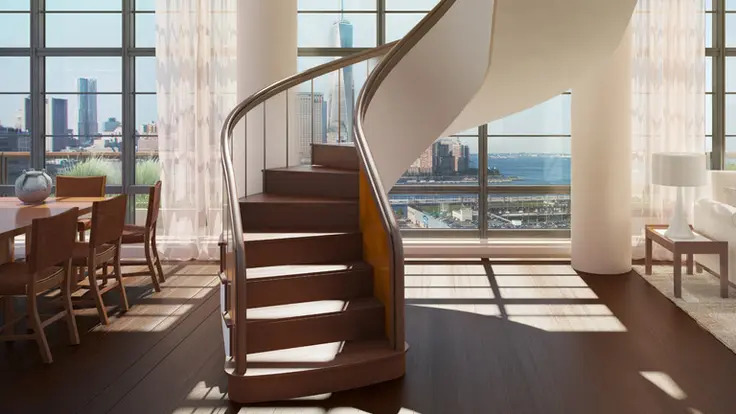 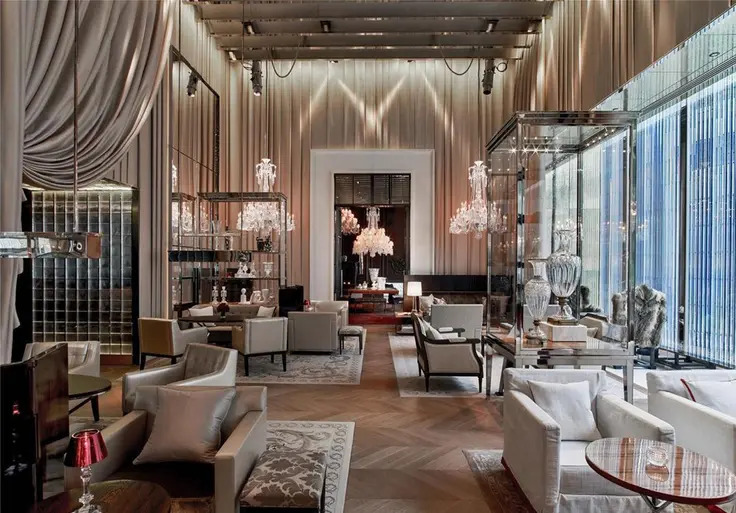 Designed by Skidmore, Owings & Merrill for Starwood Hotels, which is headed by Barry Sternlicht, it contains 61 residential condominiums above 114 hotel rooms. 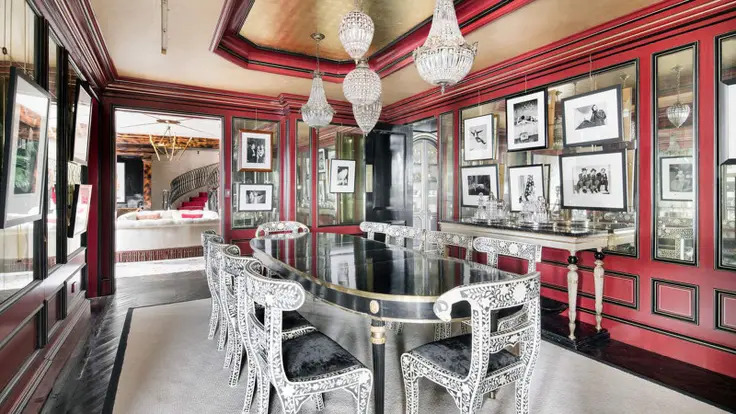 Tony Ingrao was the interior designer. 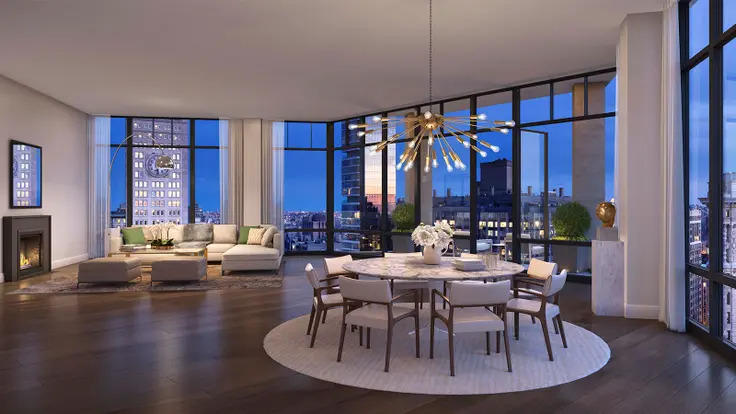 One Madison at 23 East 22nd Street is located at the crossroads of Chelsea, Madison Square Park, Gramercy and the Flatiron District. 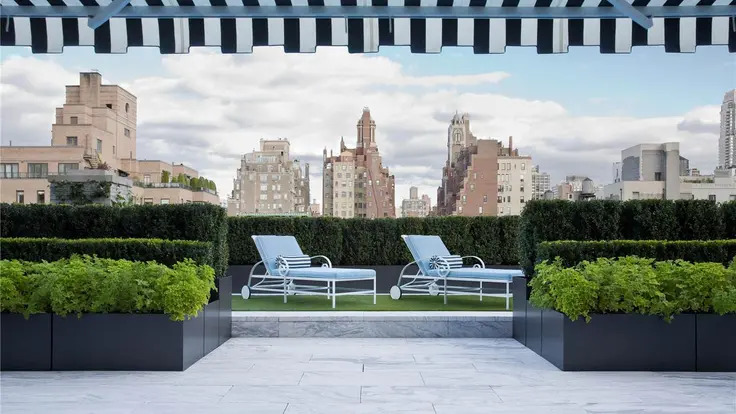 It is situated at the start of Madison Avenue. 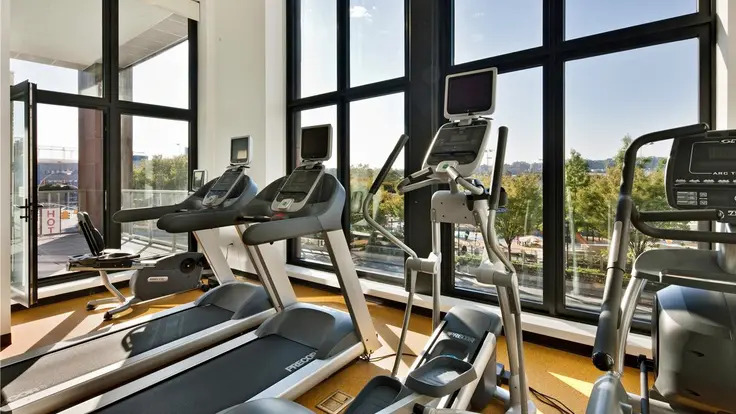 Its prior owners sold the building and it is now managed by the Related Companies. 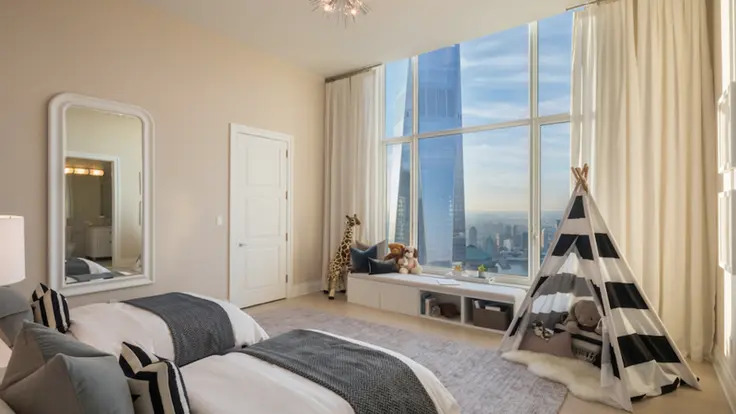 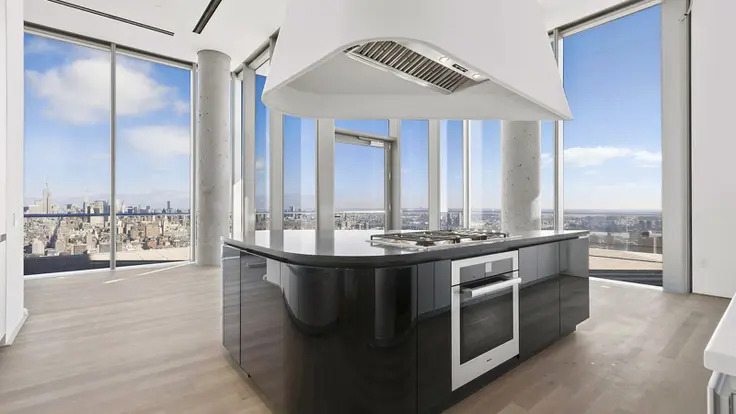 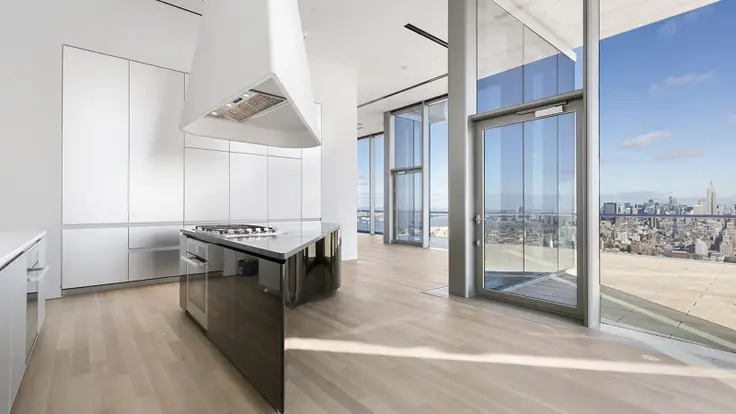 Residences are spacious and feature floor-to-ceiling windows that open to the surrounding cityscape. 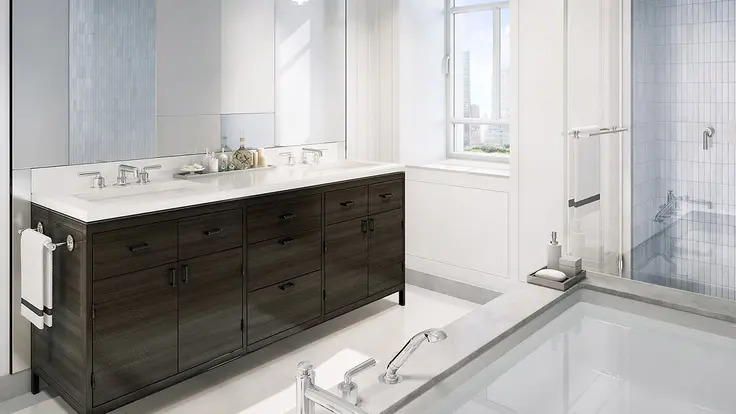 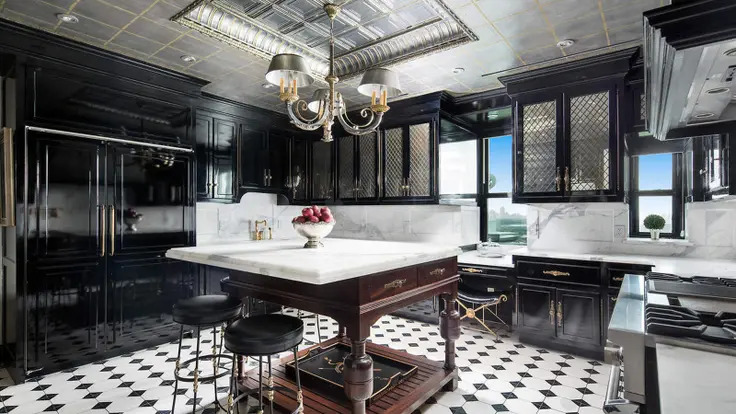 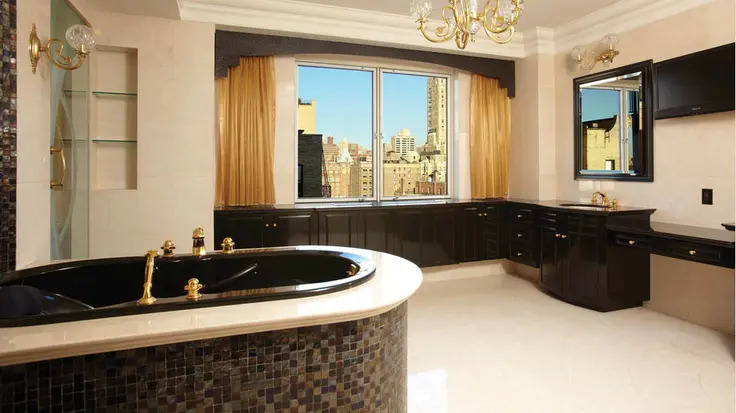 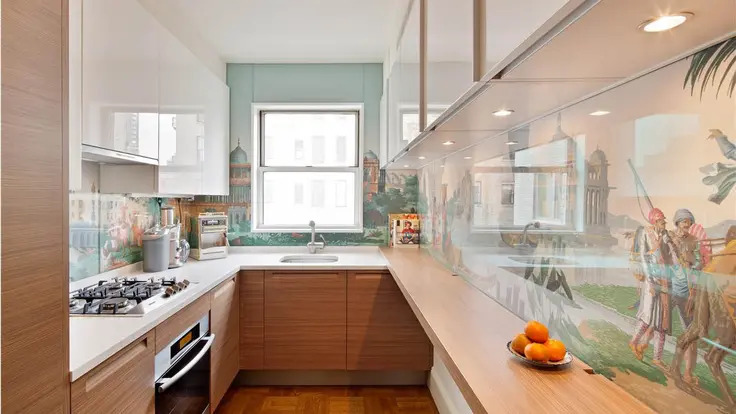 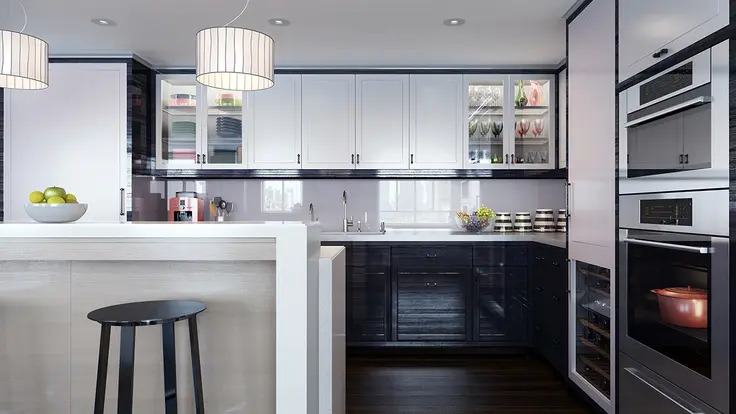 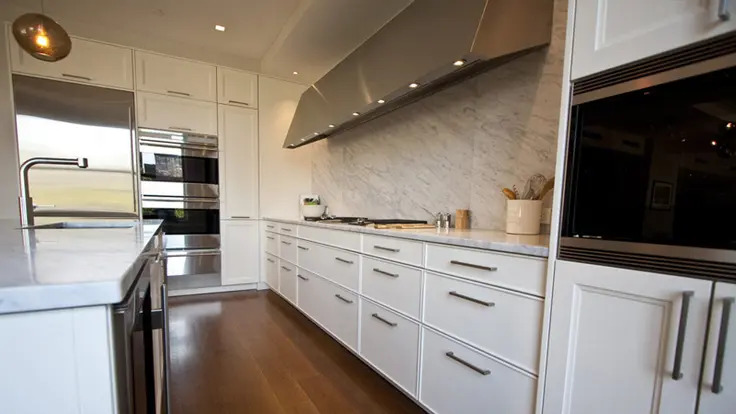 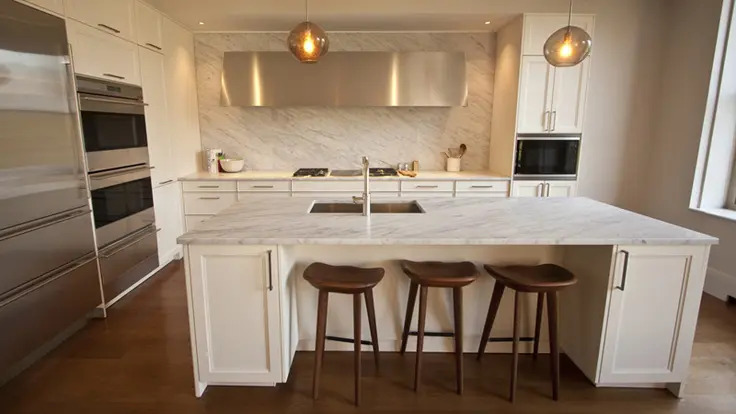 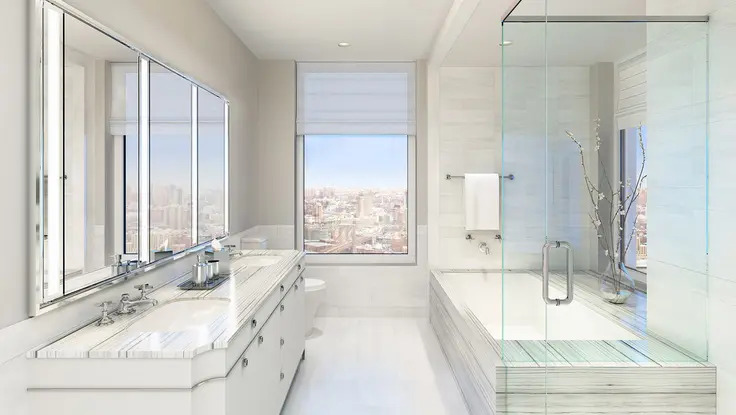 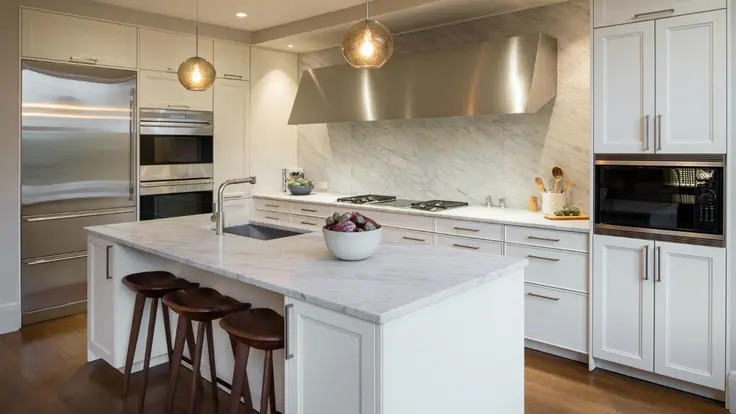 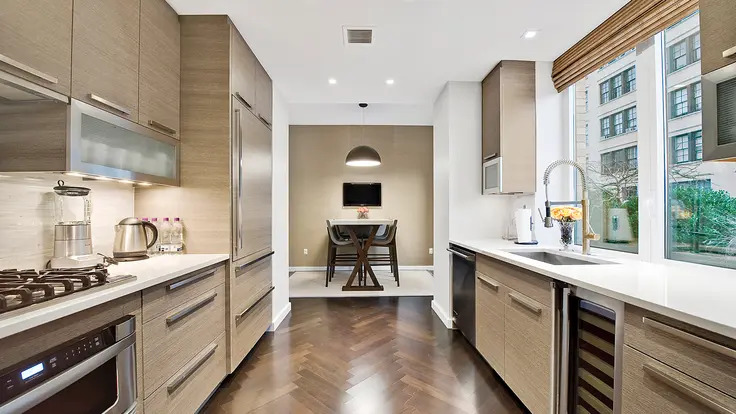 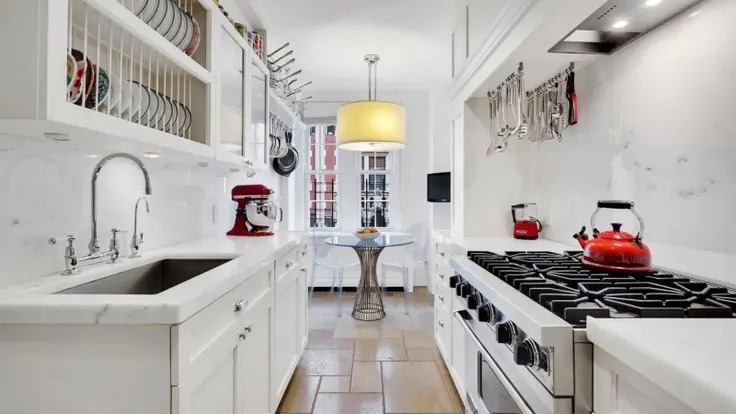 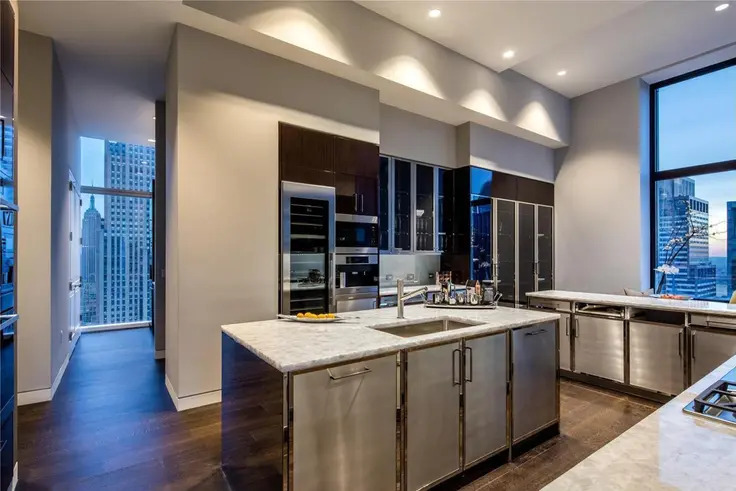 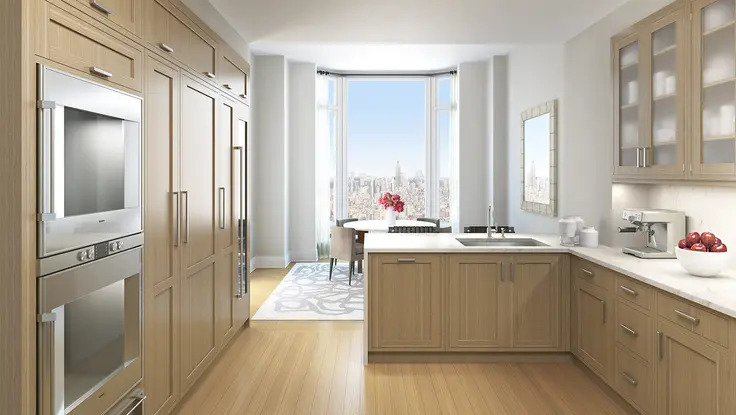 Kitchens and bathrooms have modern appliances and fixtures and many offer views of the Empire State Building and Midtown. 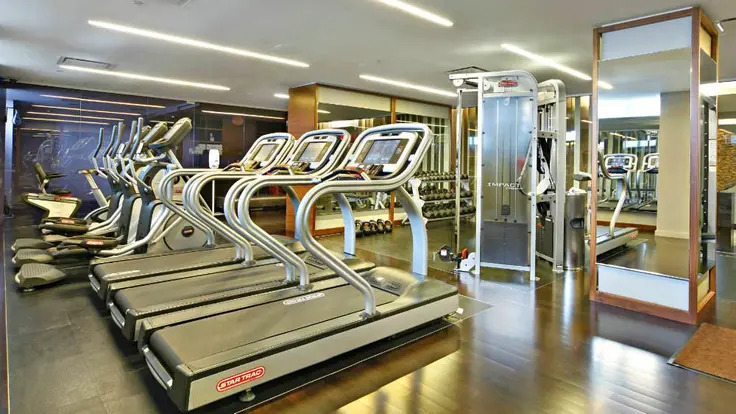 The building's One Club features amenities such as a private dining room with a gourmet catering kitchen, a lounge, a parlor with a billiards table, a lap pool, a spa with a glass-enclosed steam room overlooking Madison Square Park, a fitness center with yoga room and a children's playroom. 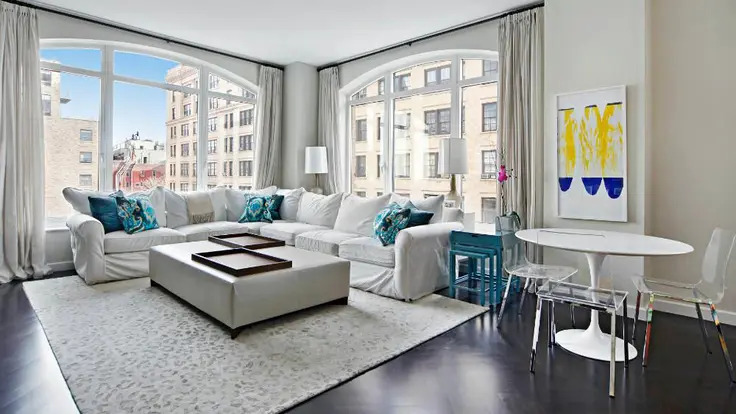 This attractive, 13-story apartment building at 40 West 66th Street on the southeast corner at Madison Avenue was erected in 1929 and converted to a condominium by Vornado Realty Trust in 2008. 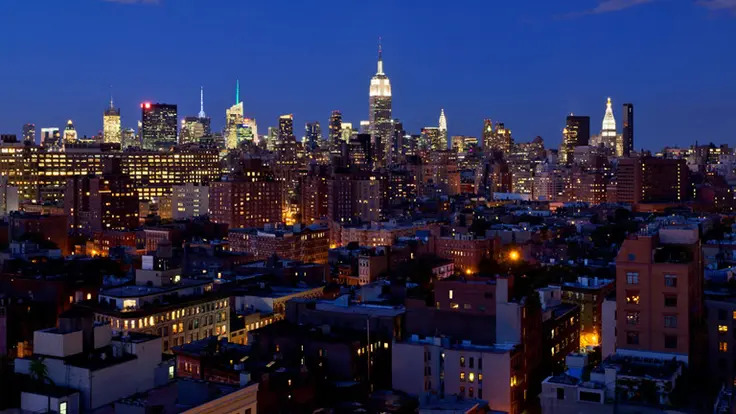 It was developed by Edward Kaye and A. Morris Levy and designed by Rosario Candela. 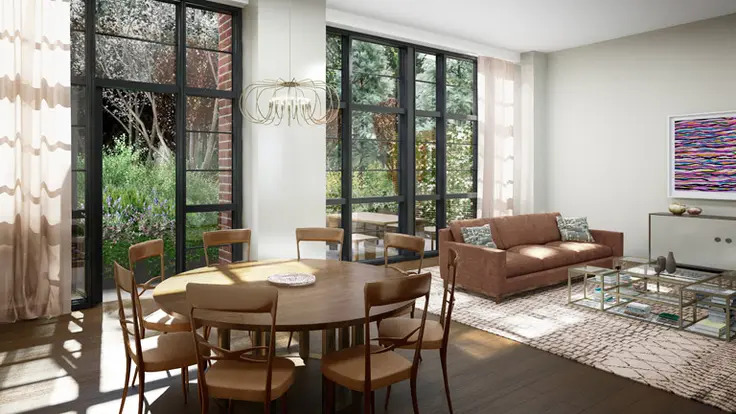 It originally had 35 three-bedroom apartments and now has 33 condominium apartments. 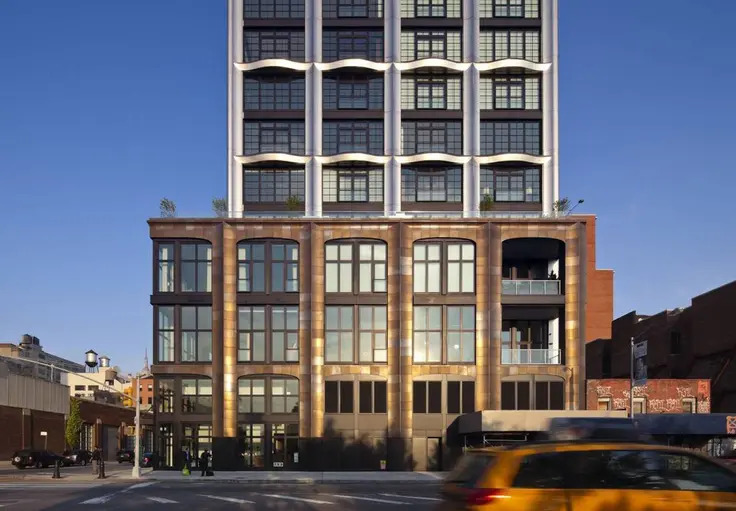 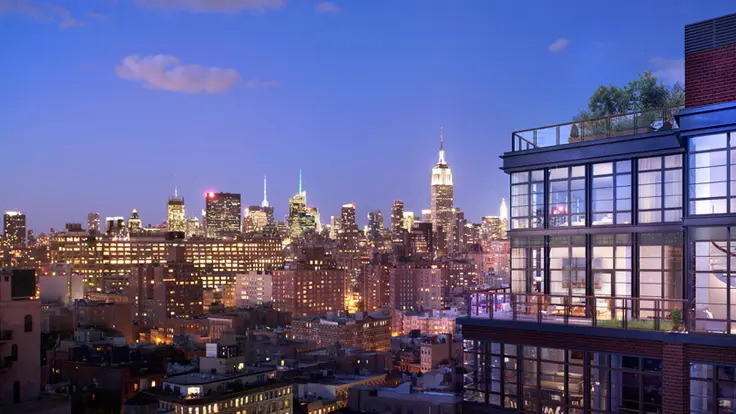 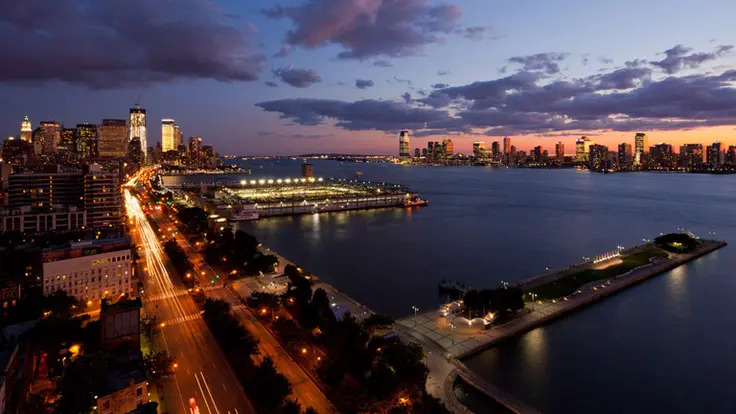 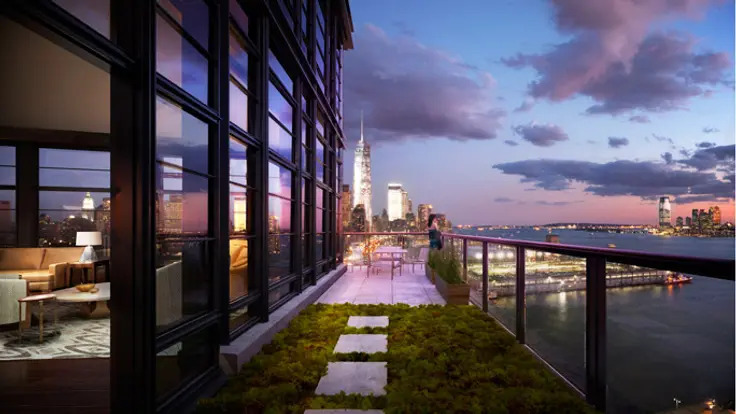 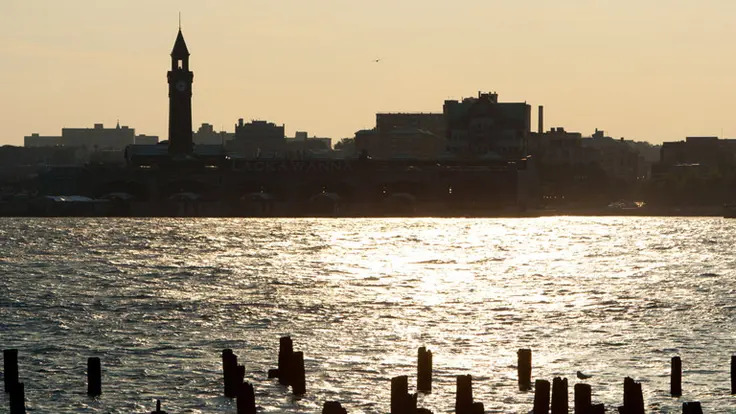 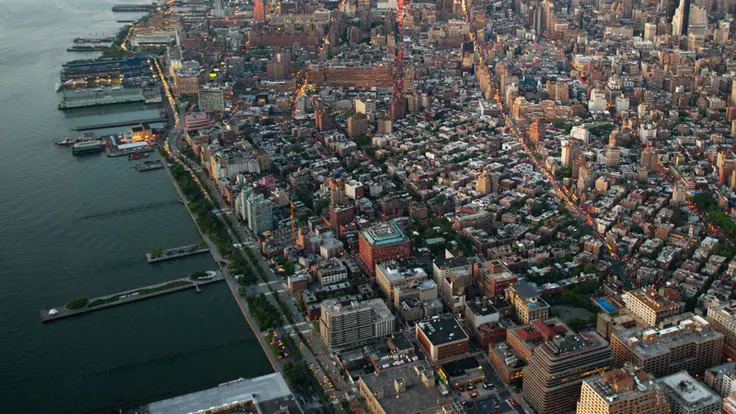 The Superior Ink development in the West Village is a large project that combines a tall building facing the Hudson River and low-rise buildings on the rest of the block. 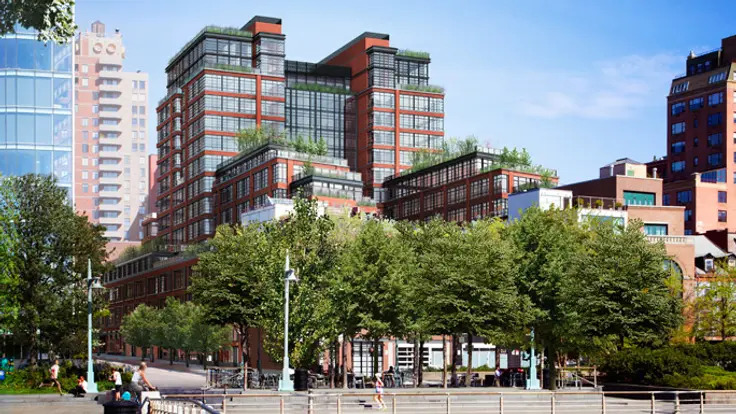 Its massing is somewhat similar to another waterfront project completed a few years earlier several blocks to the south, Morton Square. 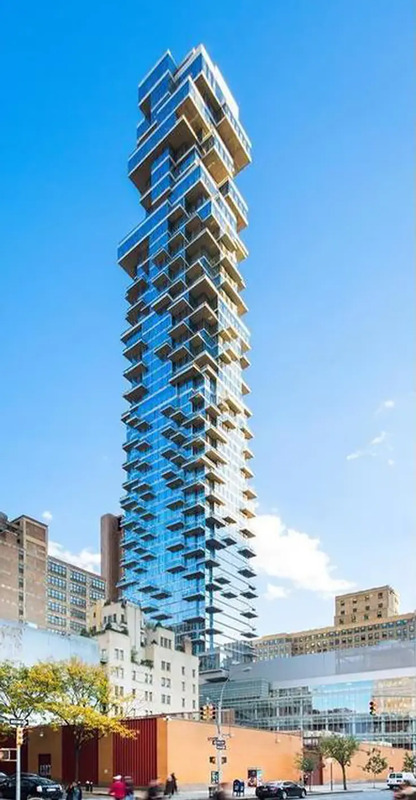 This one was developed by the Related Companies and was completed in 2010. 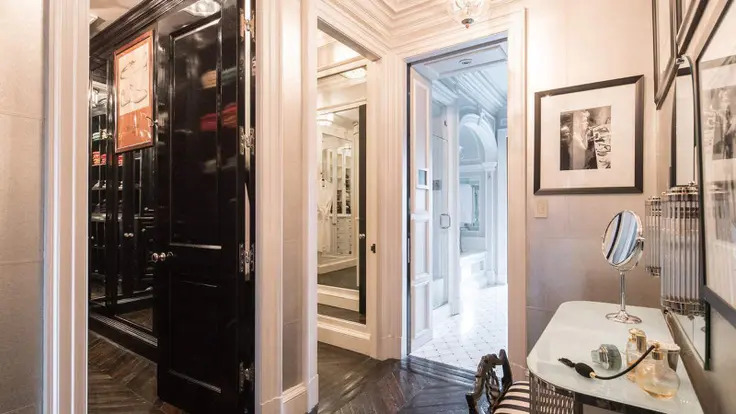 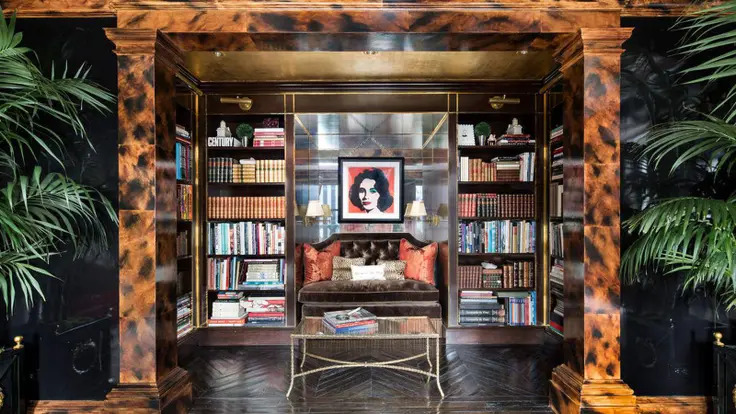 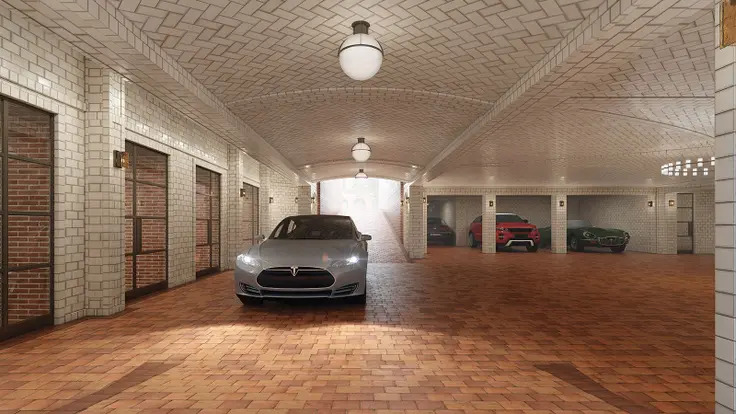 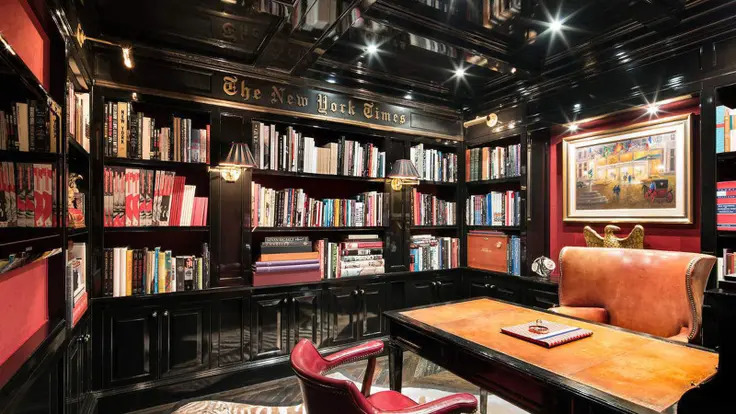 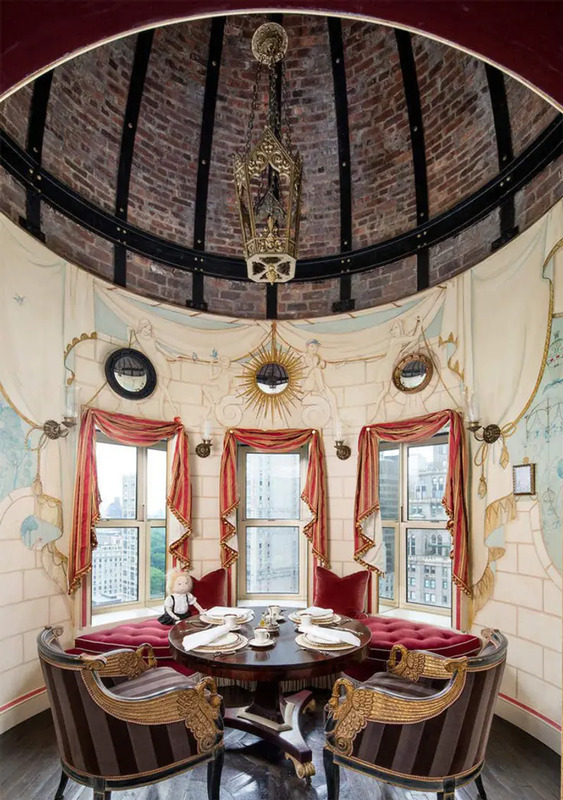 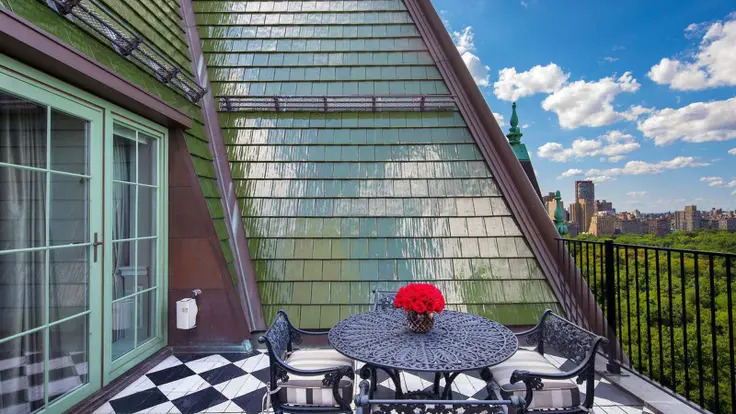 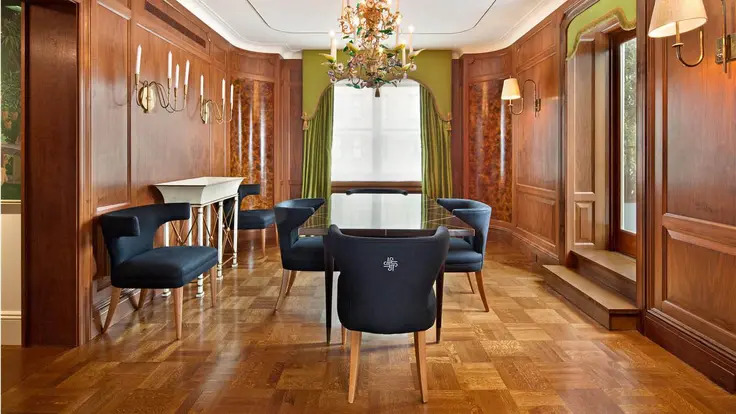 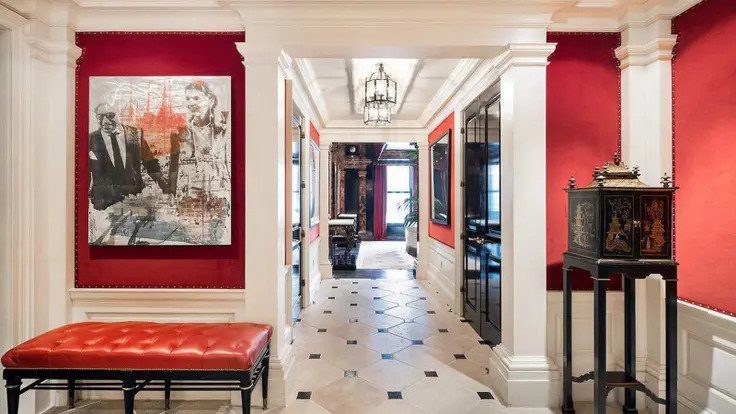 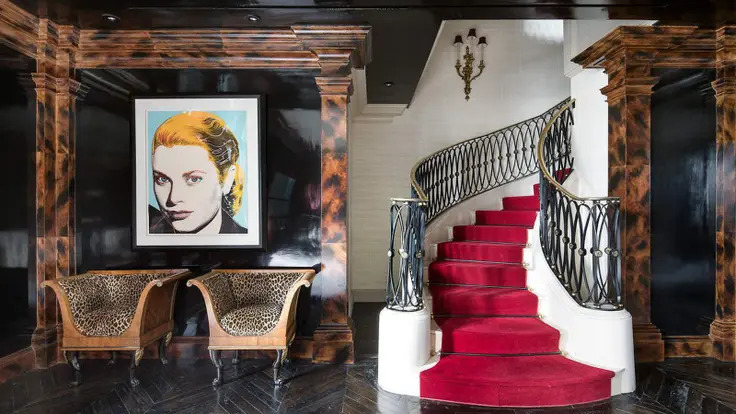 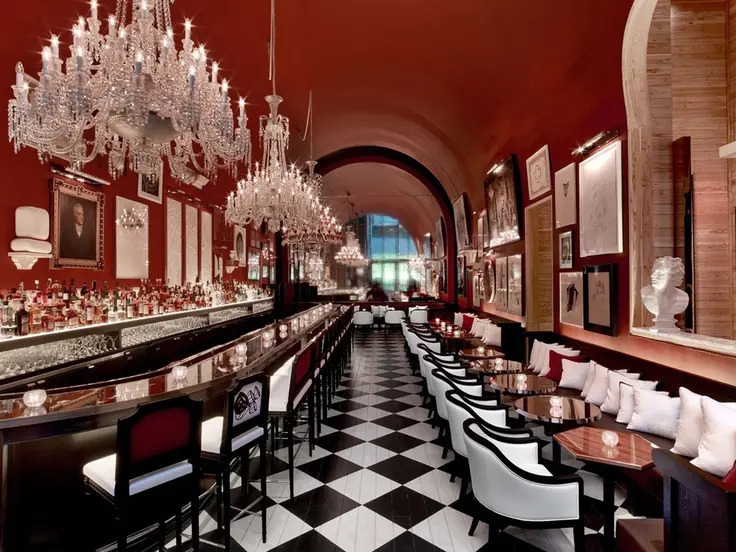 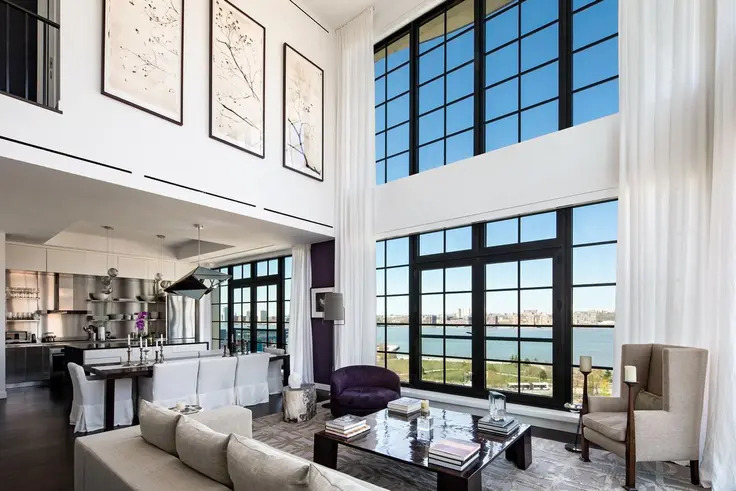 It was designed by Robert A. M. Stern, who is best known for 15 Central Park West, the Chatham and the Brompton. 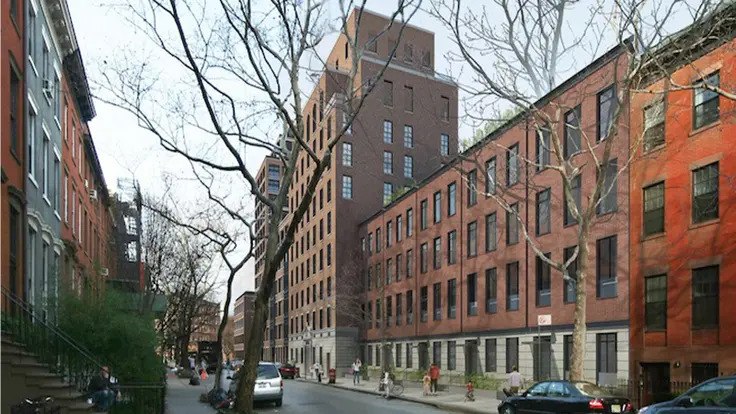 This development has a 17-story tower with 62 apartments on West Street with two setbacks and 7 townhouses on Bethune Street. 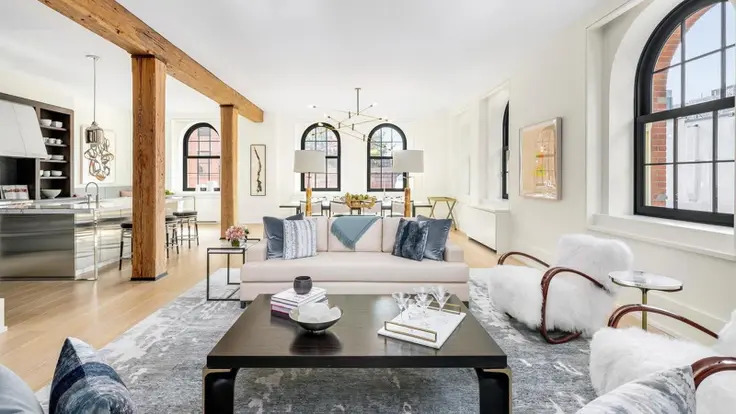 This extremely handsome, 7-story, red-brick building at 443 Greenwich Street between Desbrosses and Vestry streets in TriBeCa that was erected in the 1880s was converted to 53 residential condominiums in 2014. 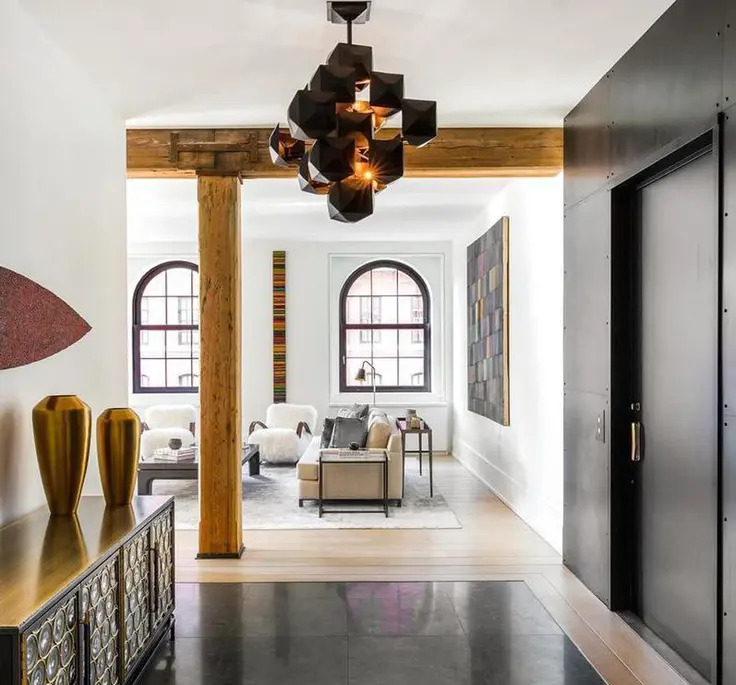 Metro Loft Management of which Nathan Berman is a principal has previously done only rentals and is the developer and Cetra/Ruddy was the architect for the conversion. 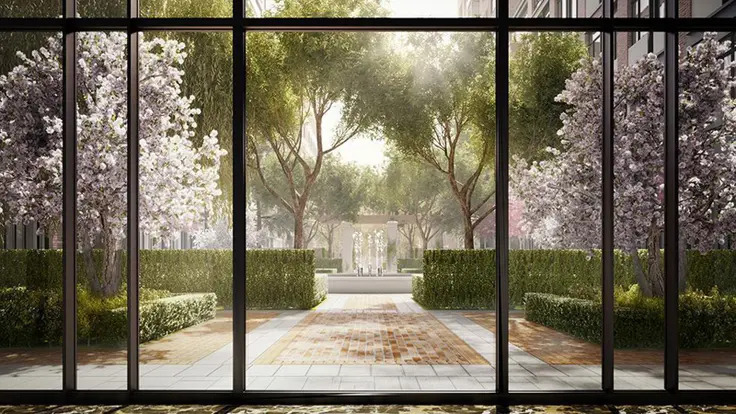 Hank White was the landscape architect. 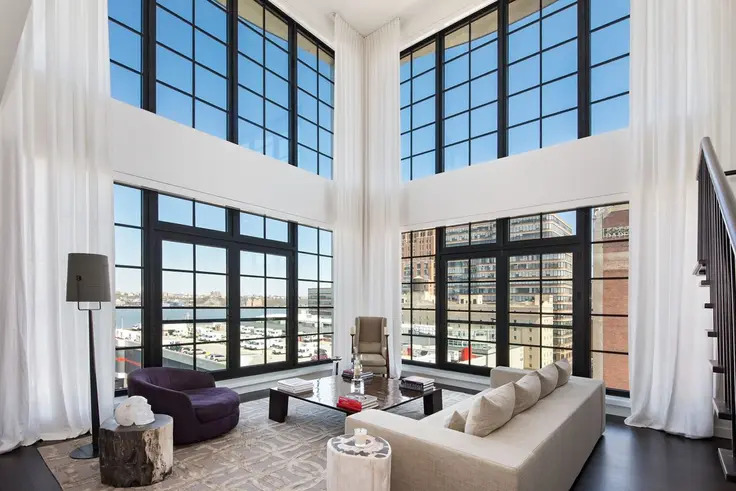 The building, which over the years served silver, drug, book-binding, toy and steel-wool companies, is distinguished by its large, 6-sided, 4,000-square-foot, landscaped courtyard with sassafras trees overlooked by 600 windows with shutters. 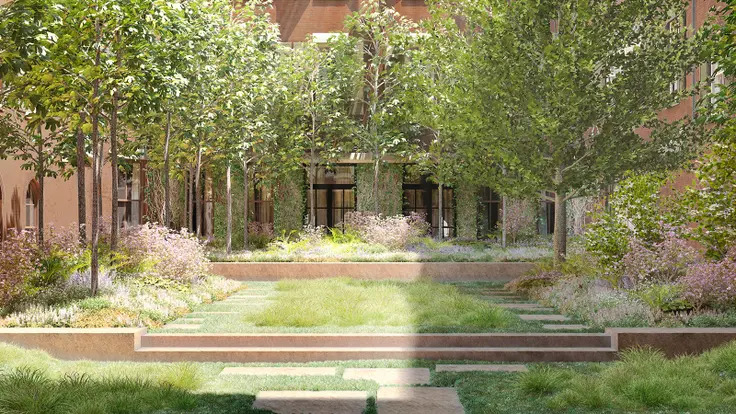 The courtyard will close at 7 PM. 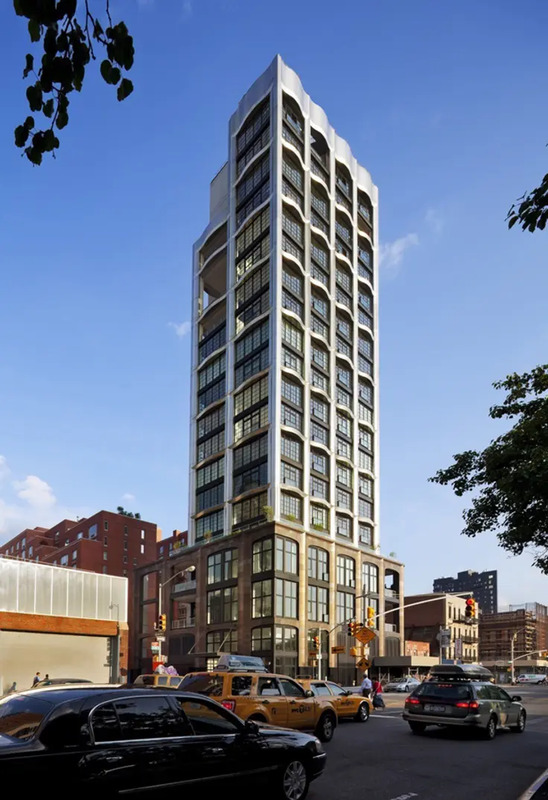 The 17-story, 53-unit building at 160 West 12th Street is part of the Greenwich Lane development. 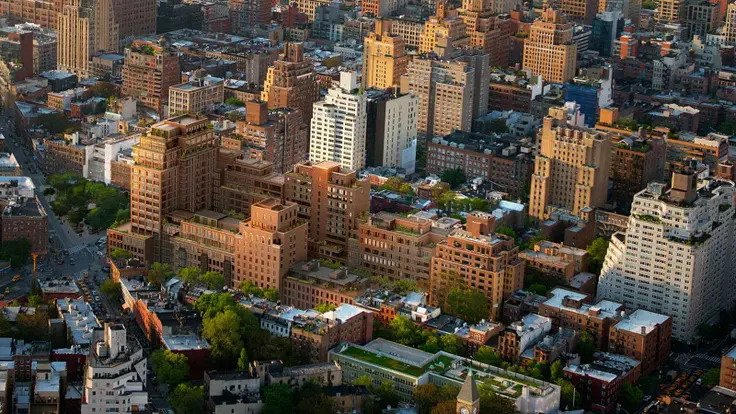 FXCollaborative was the architect of transformation of St. Vincent's Hospital into one of the city's most sought-after condominiums. 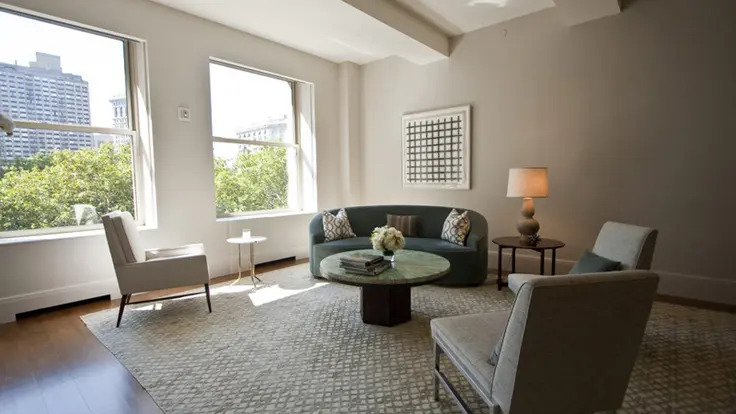 Finely crafted apartments combine old New York glamour with modern living. 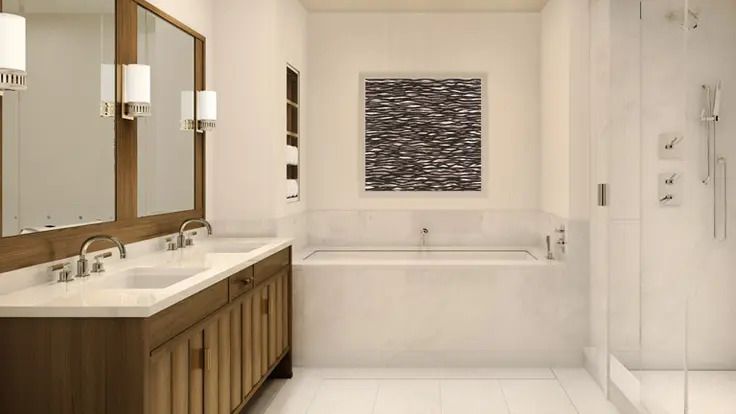 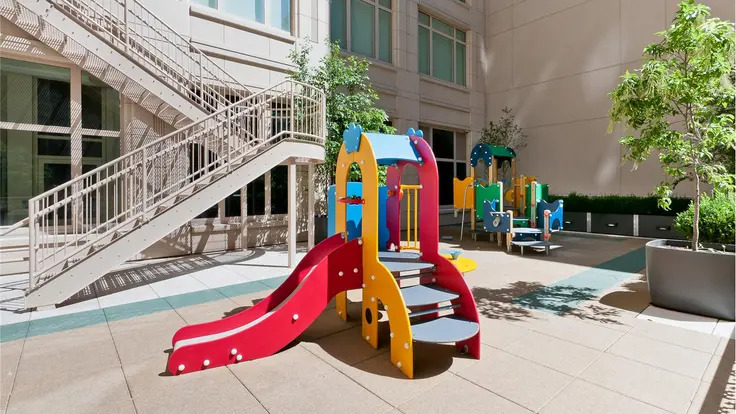 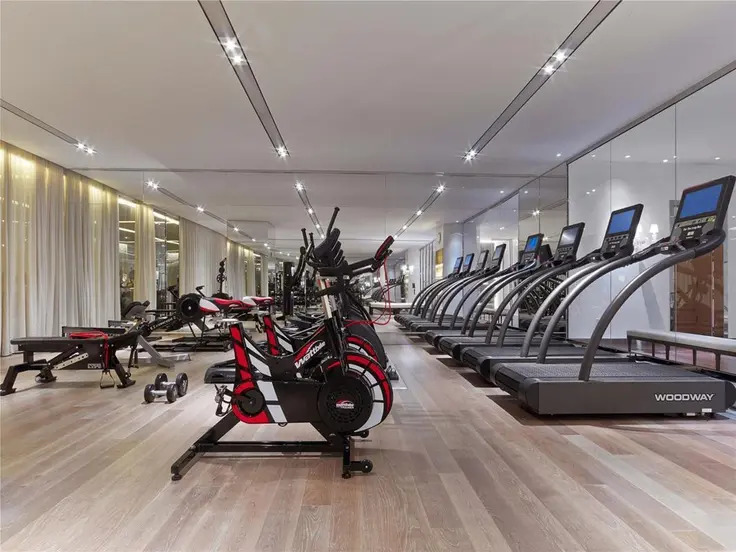 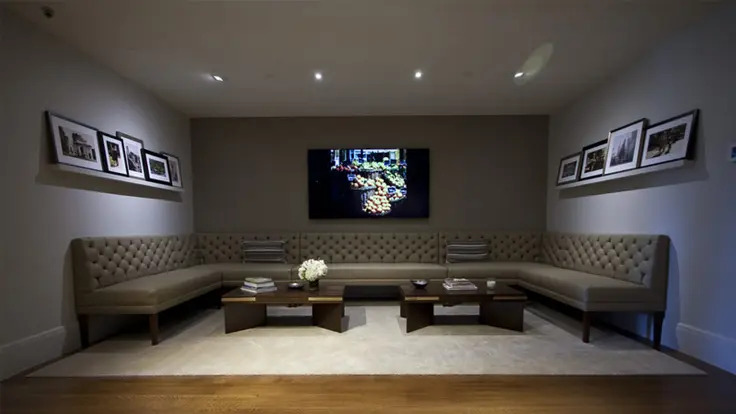 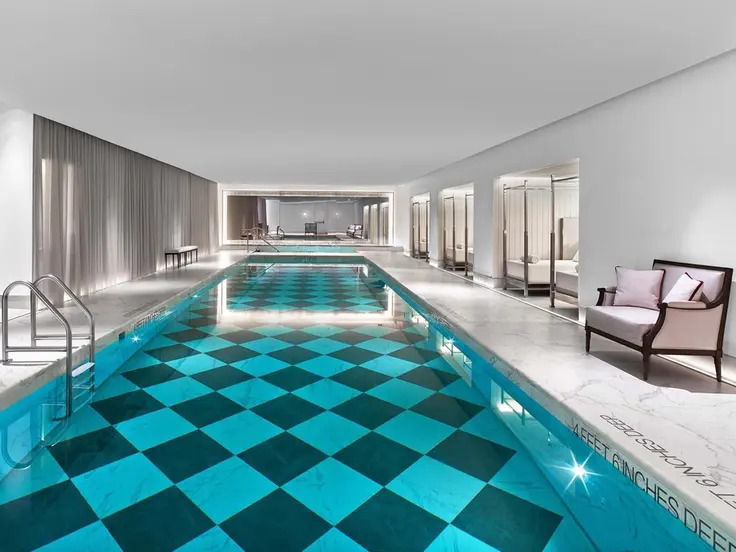 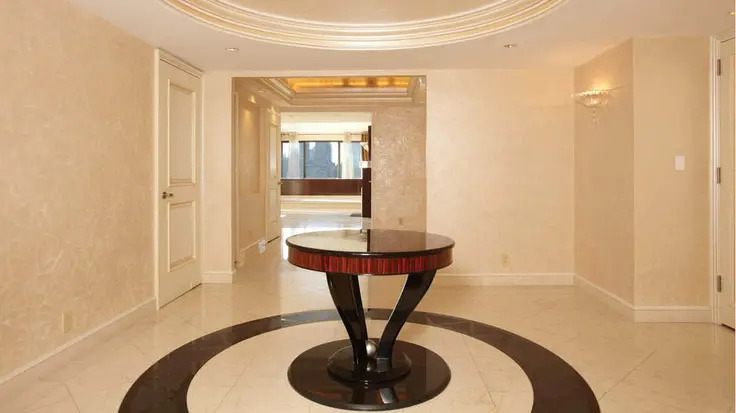 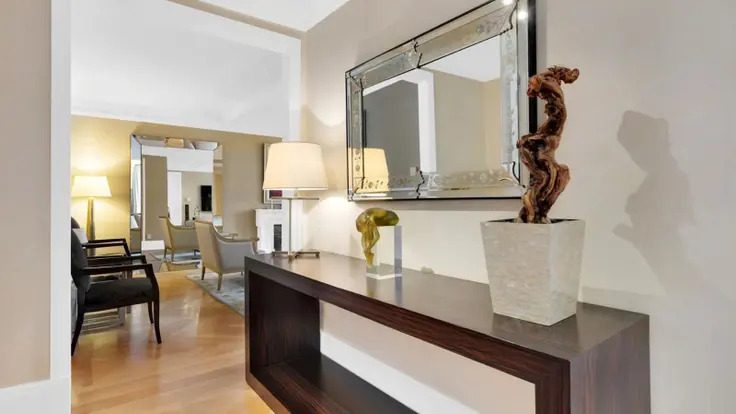 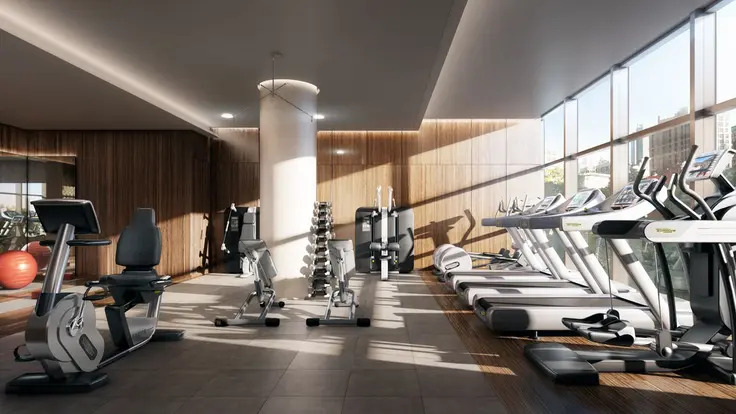 Amenities include a central garden with landscaping by M. Paul Friedberg & Partners, a dedicated fitness floor with pool and golf simulator, a private screening room with wet bar, a lounge with dining room, and kitchen, a 24-hour attended lobby, and an underground garage. 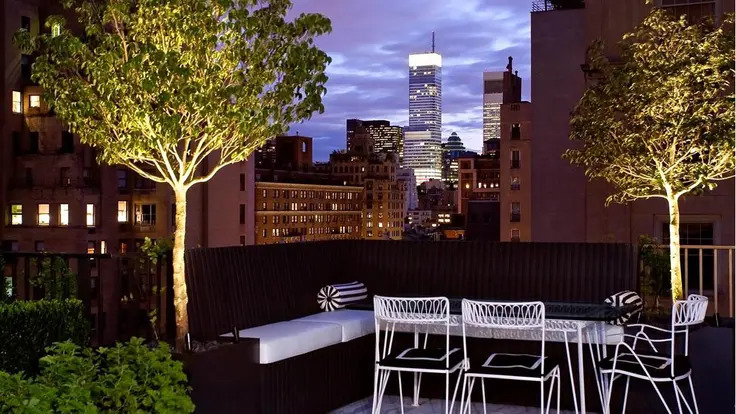 Deep in the heart of Greenwich Village, the Greenwich Lane is a short walk from the High Line, the Meatpacking District, and Chelsea. 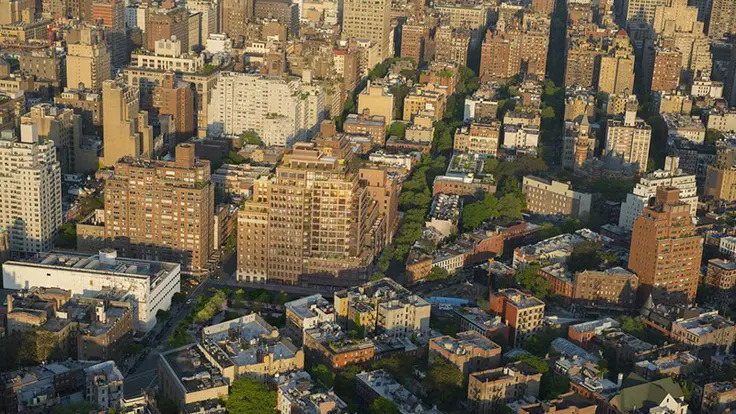 The New York City AIDS Memorial is across the street. 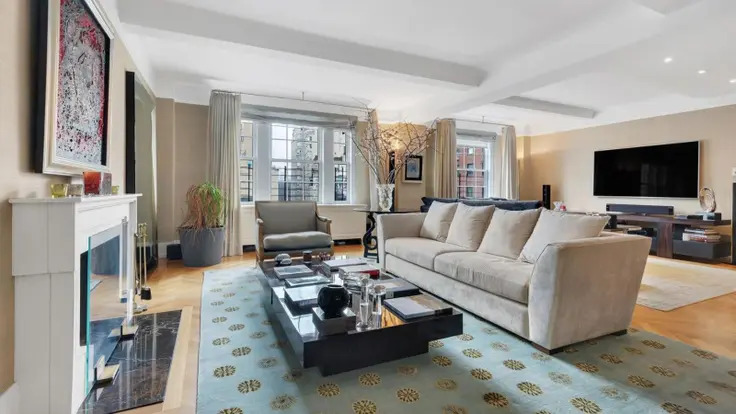 The Carlton House is a 16-story, brown-brick, apartment building occupies the entire western blockfront on Madison Avenue between 61st and 62nd Street. 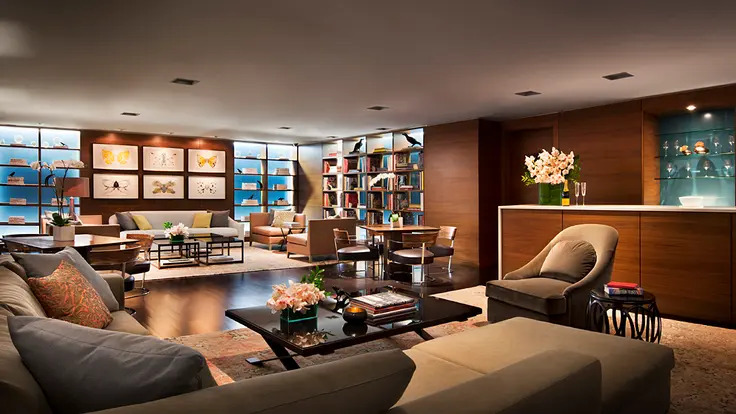 It was designed by Kenneth B. Norton in 1950 and contained 161 units, mostly suites. 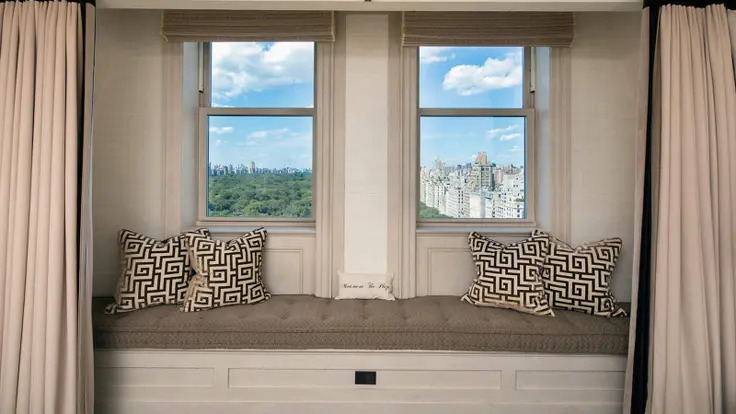 The building, whose address is 680 Madison Avenue, has several terraces and some bay windows. 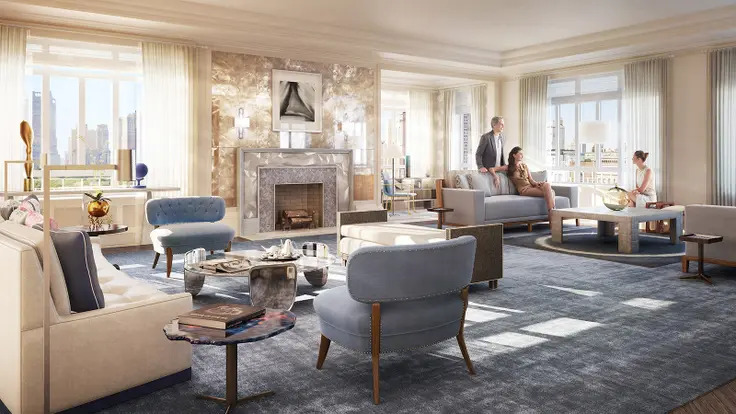 The Landmarks Preservation Commission approved Extell Development Company's rehabilitation and restoration plans for the former Carlton House Hotel at 680 Madison Avenue (between 61st and 62nd Streets) in Manhattan on July 19, 2011. 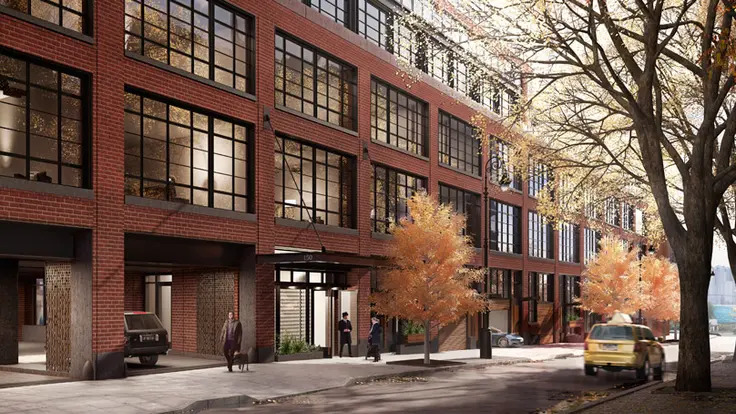 The unanimous vote cleared the way for Extell and its partner, Angelo Gordon & Company, to proceed with their plans to convert the building’s hotel and residential units to 68 apartments and one townhouse unit. 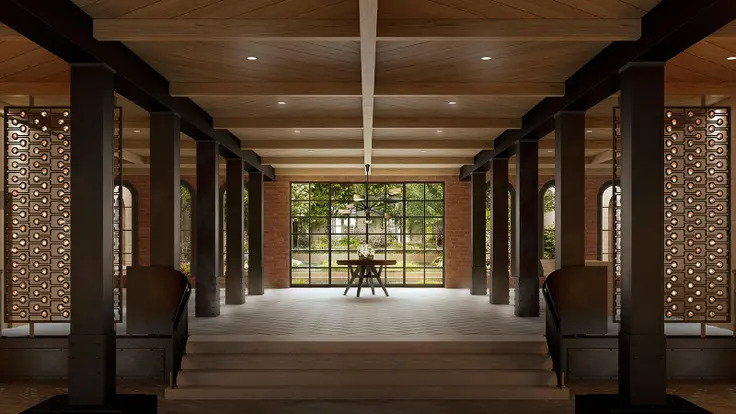 The architect for the conversion is Beyer Blinder Belle Architects & Planners LLP. 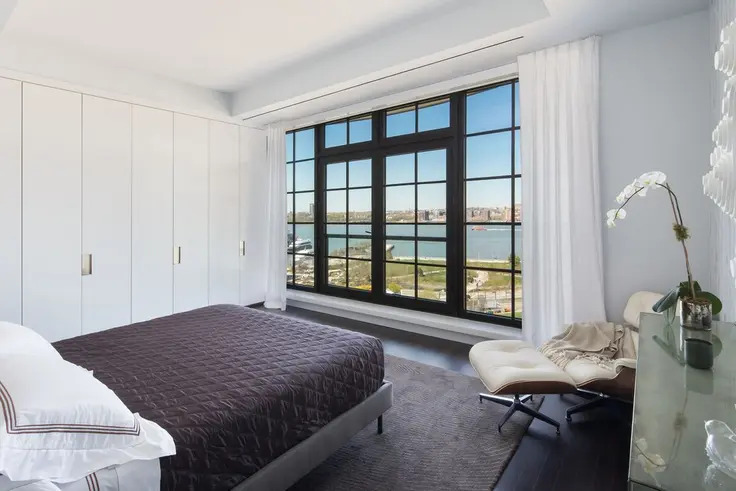 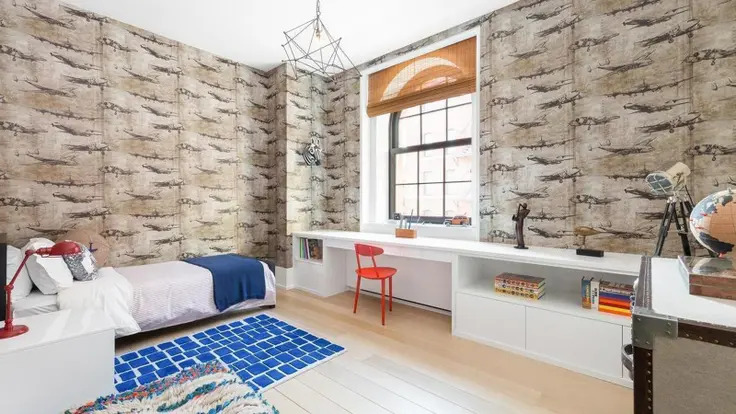 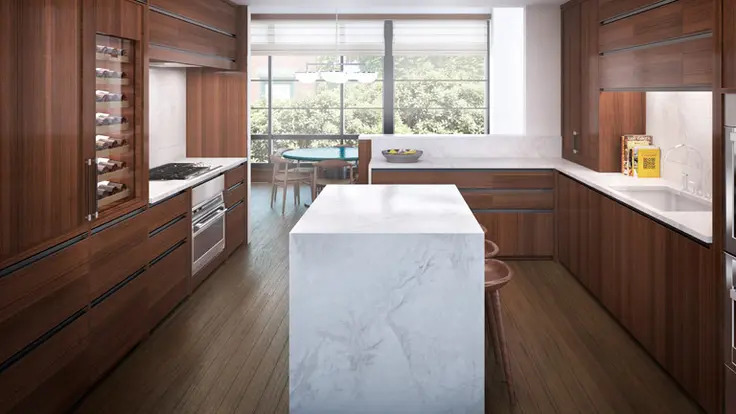 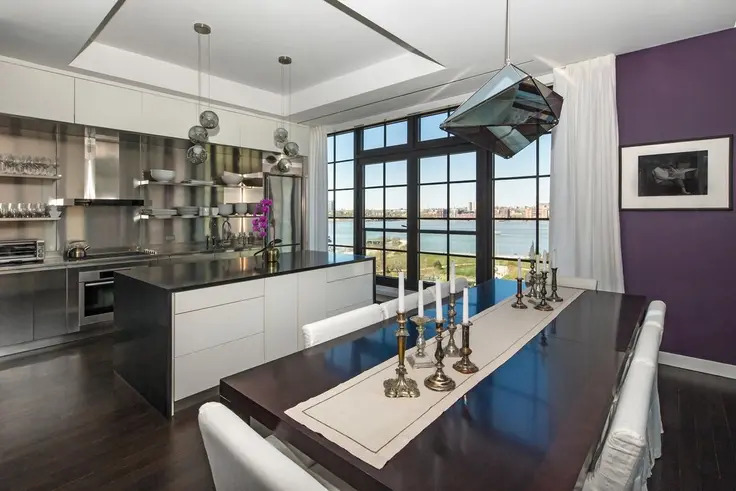 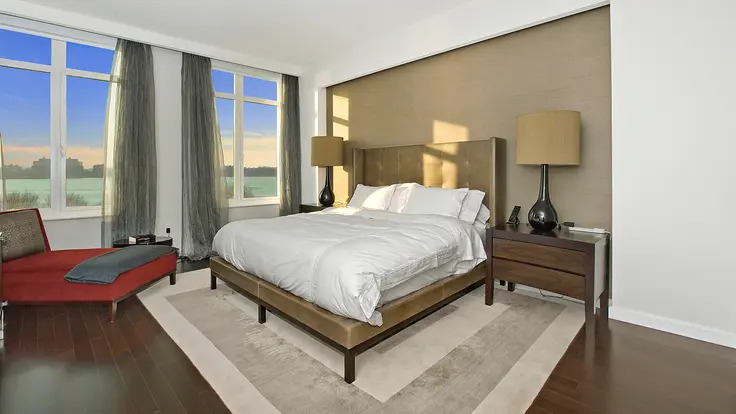 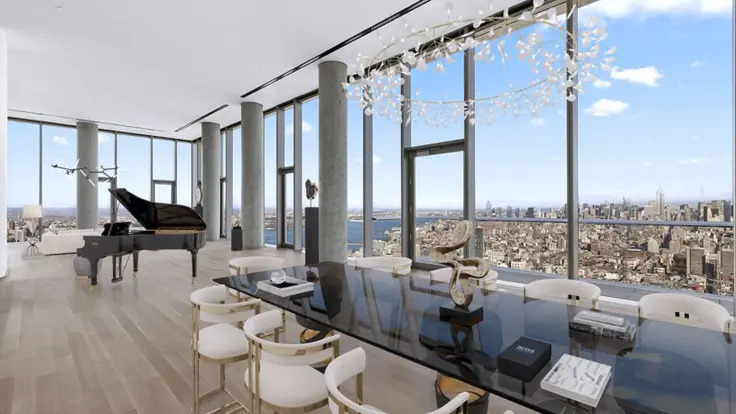 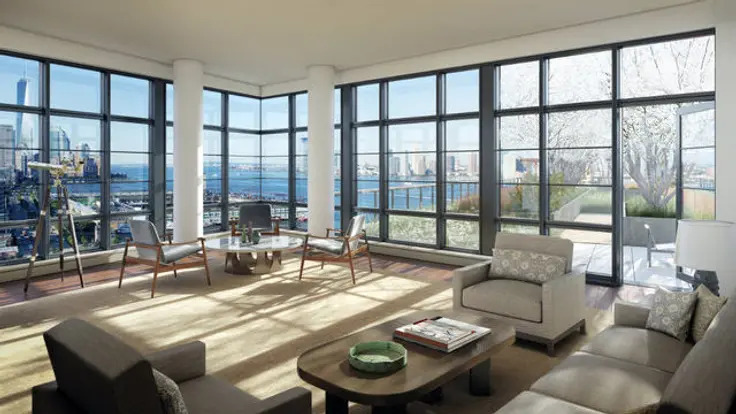 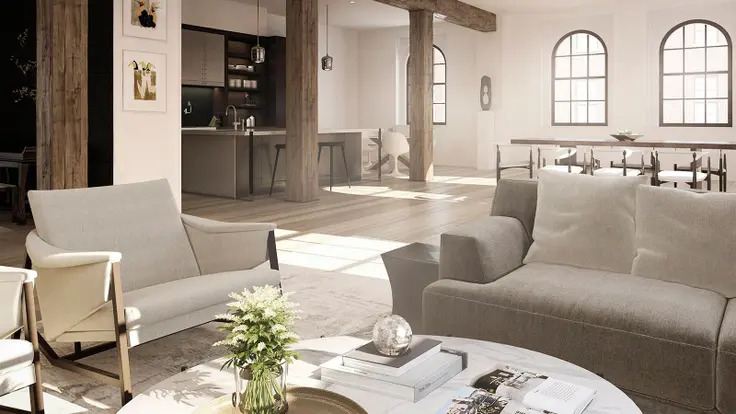 Deep in the Far West Village, the 15-story, 91-unit full-service condominium at 150 Charles Street overlooks the Hudson River. 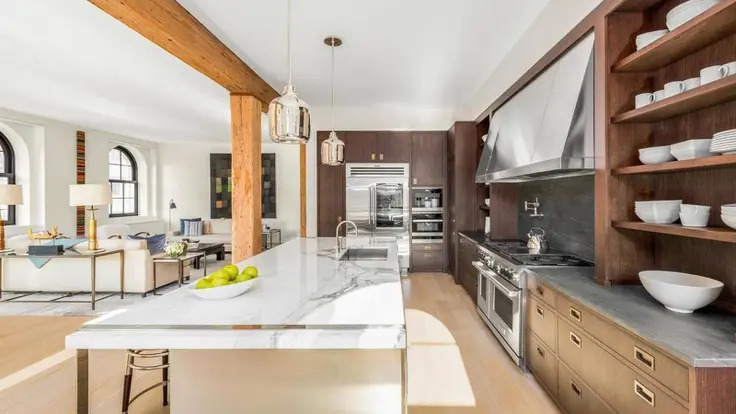 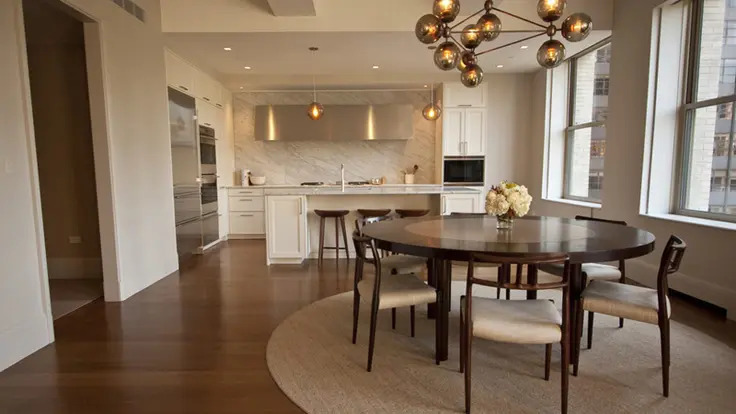 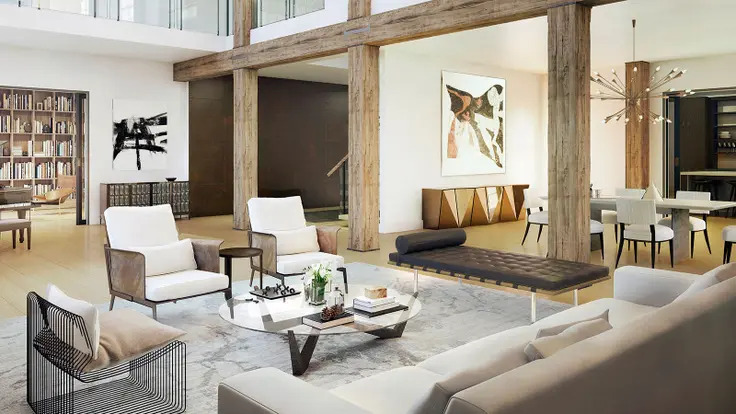 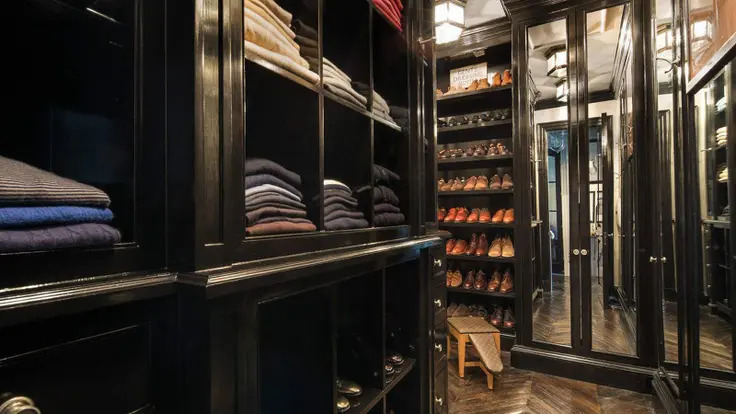 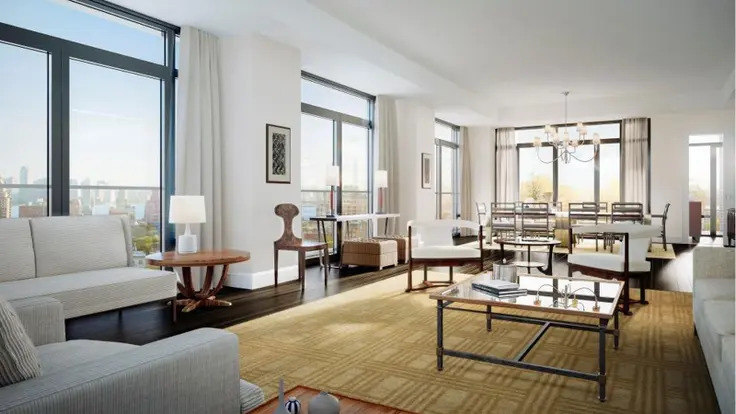 Interiors by Alan Wanzenberg feature hardwood floors, soaring ceilings, loft-style windows, beautiful proportions, abundant closet space, and top-of-the-line kitchens. 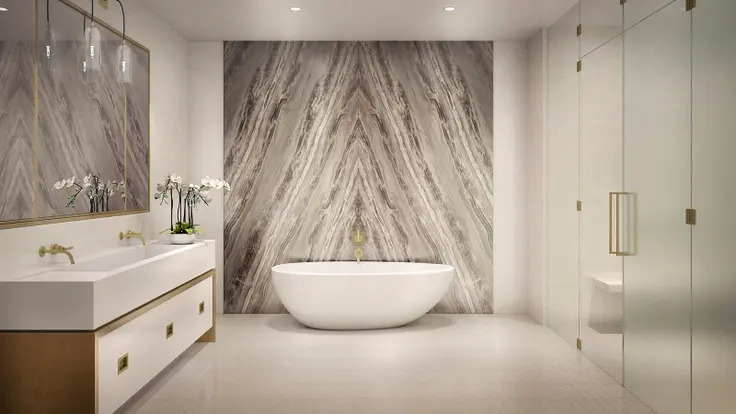 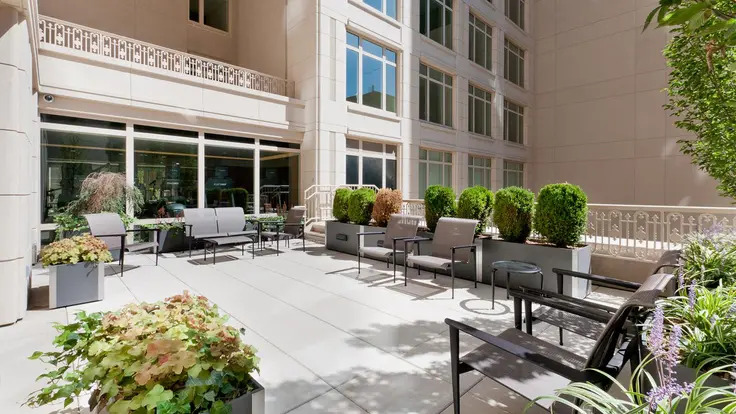 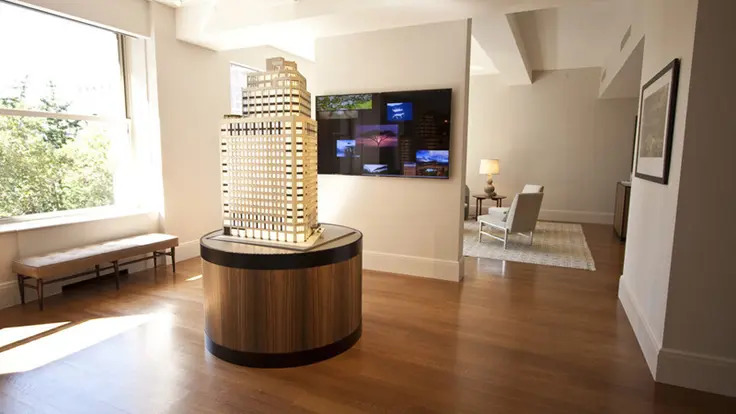 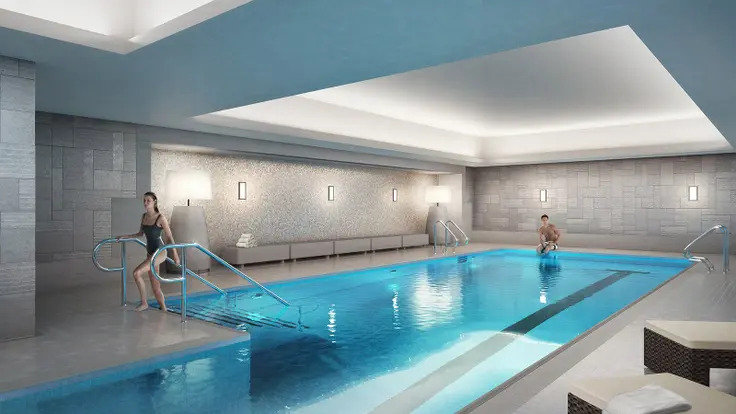 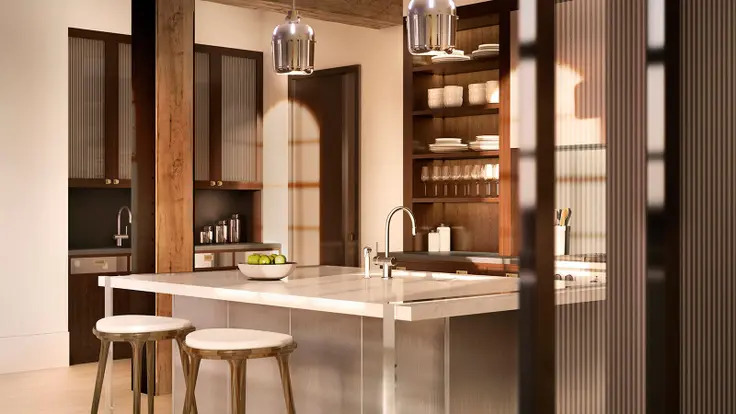 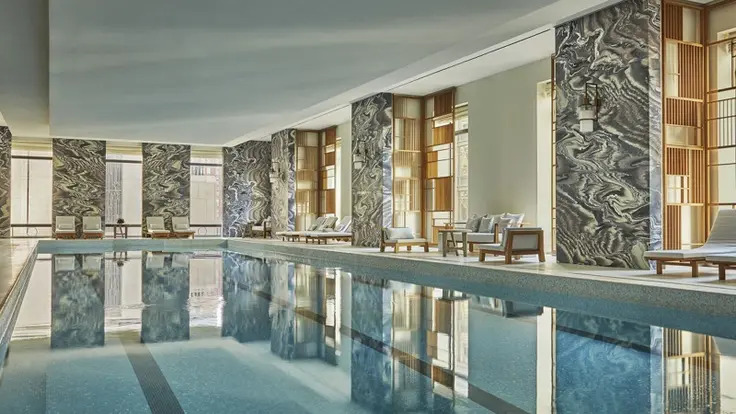 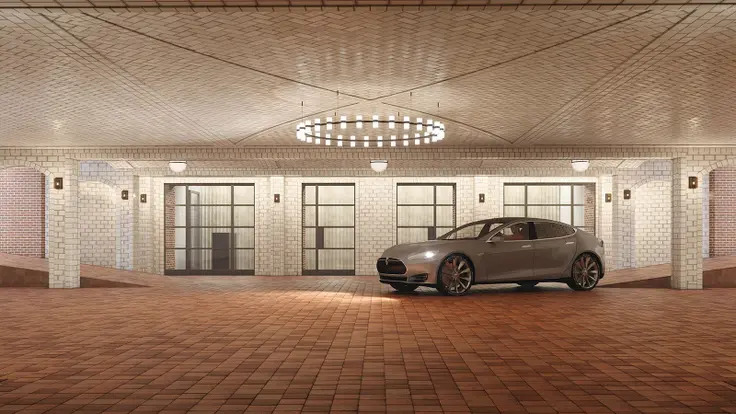 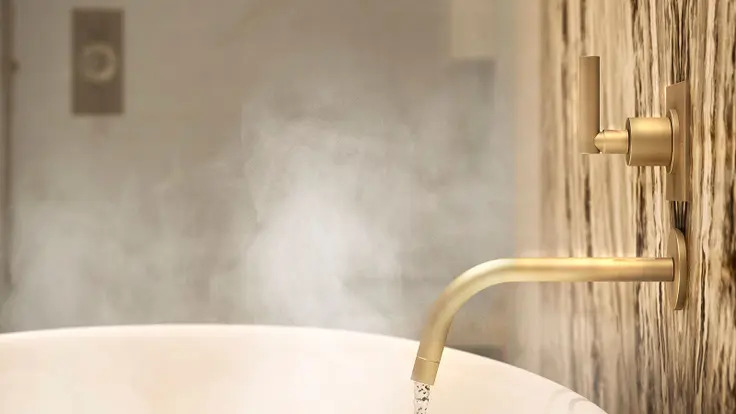 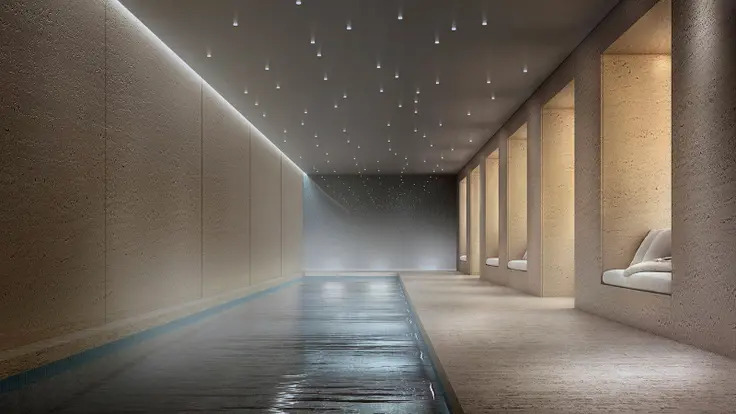 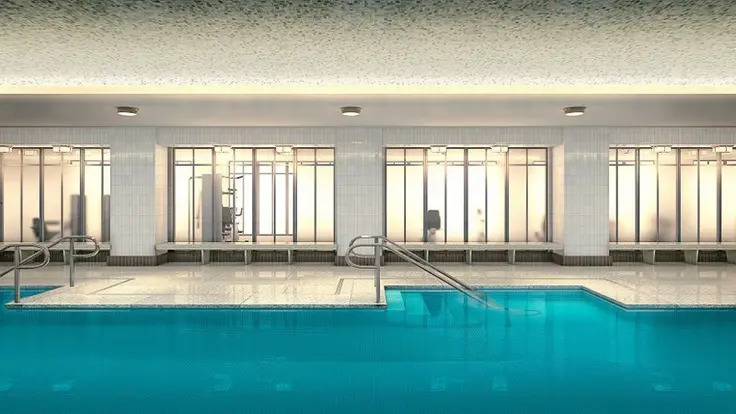 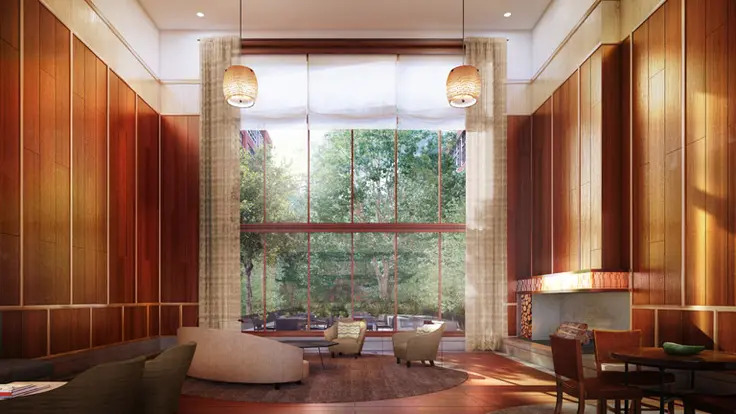 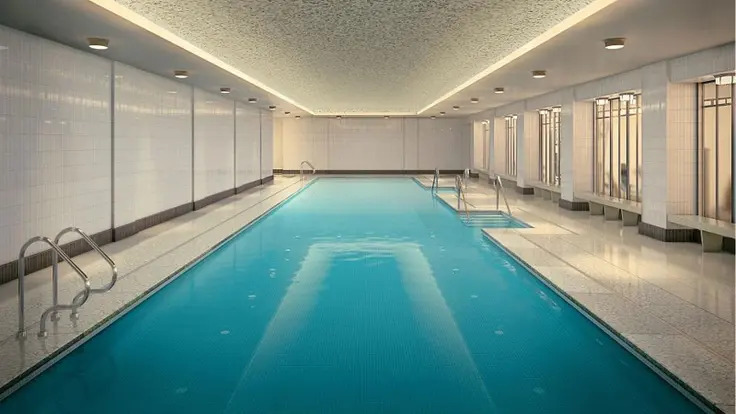 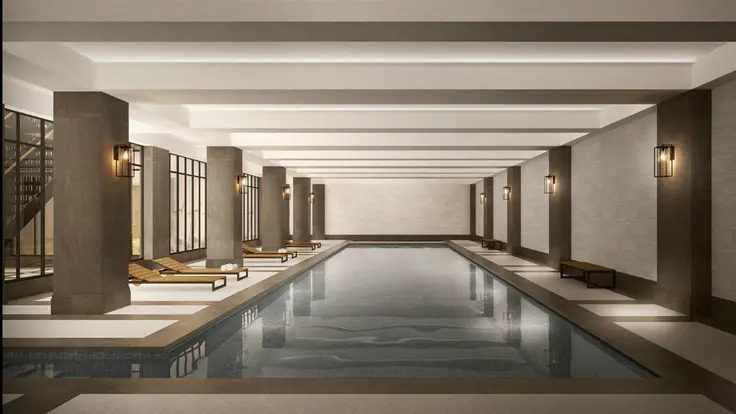 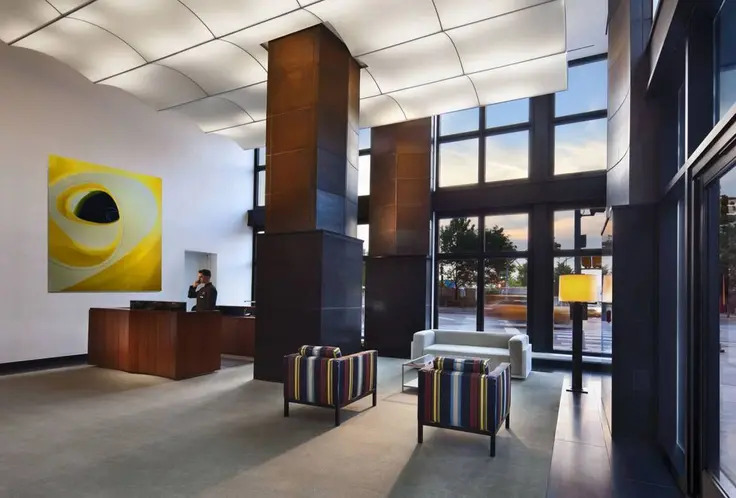 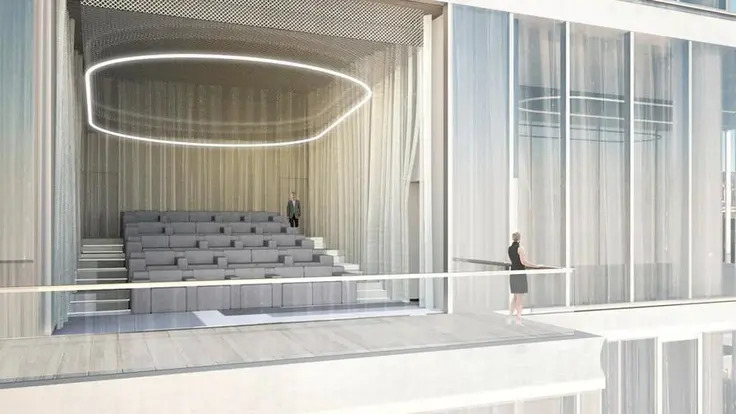 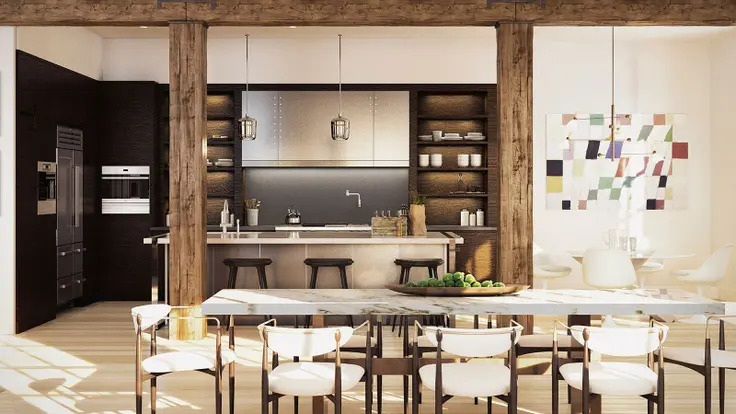 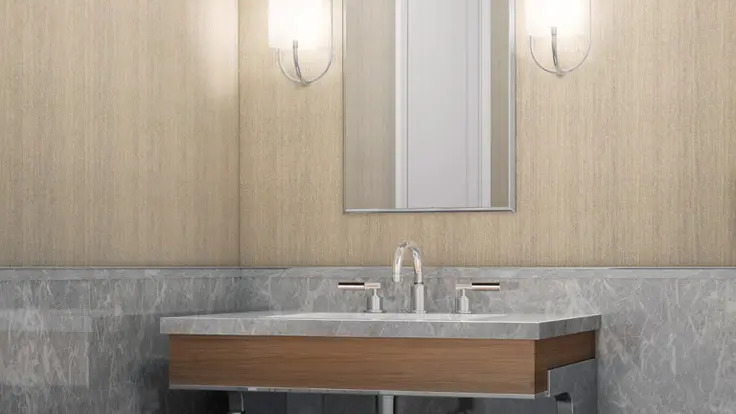 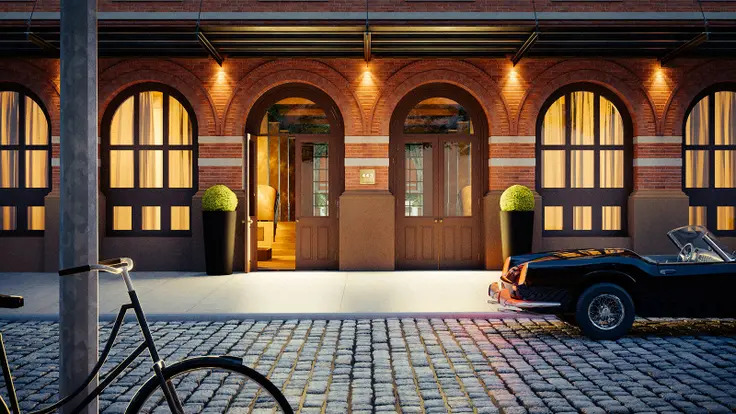 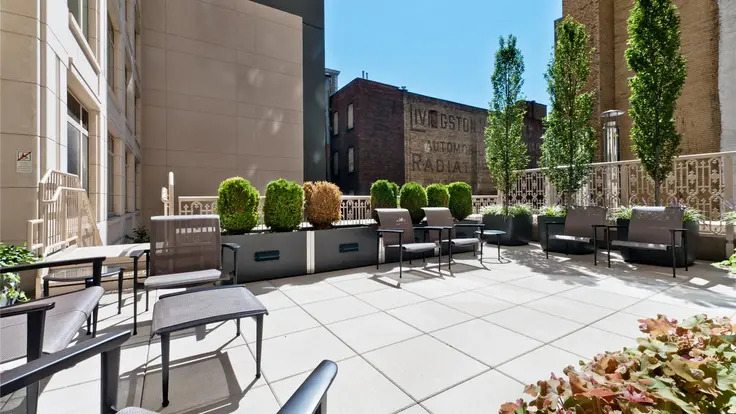 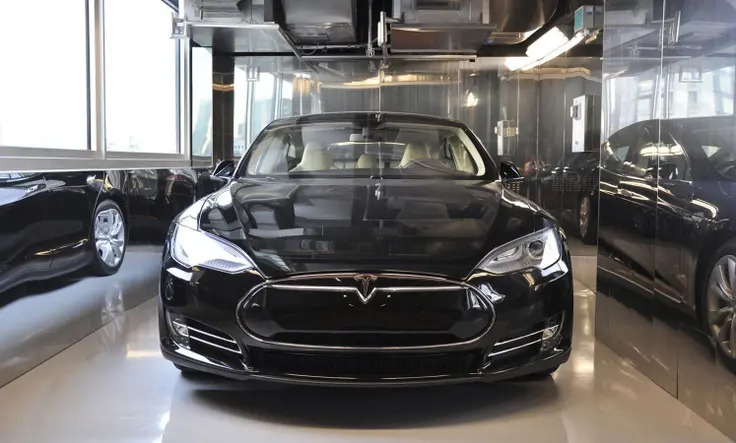 Amenities at 150 Charles Street include an attended lobby, hotel concierge service, state-of-the-art fitness center, pool and spa, event room with catering kitchen, drive-in entry, and elegant courtyard and Zen garden. 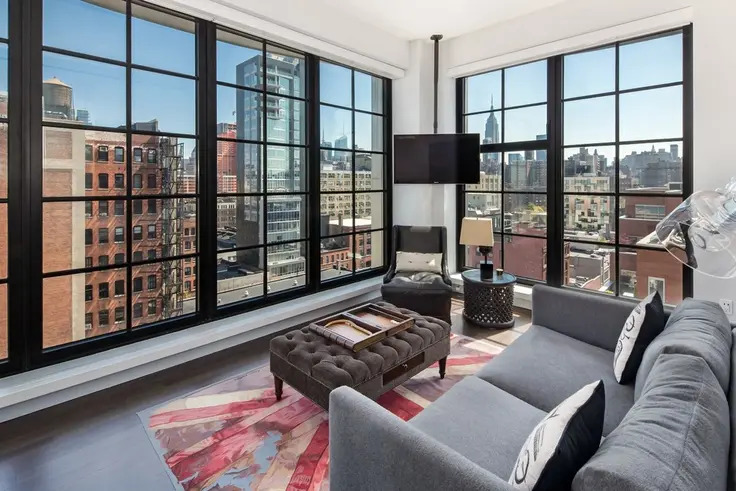 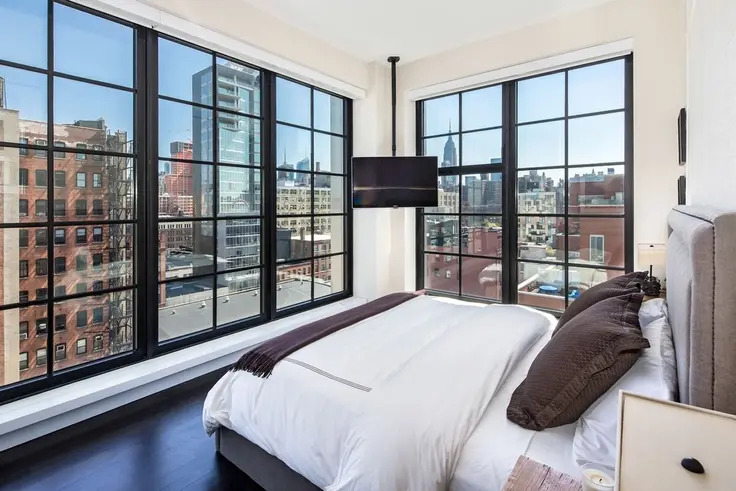 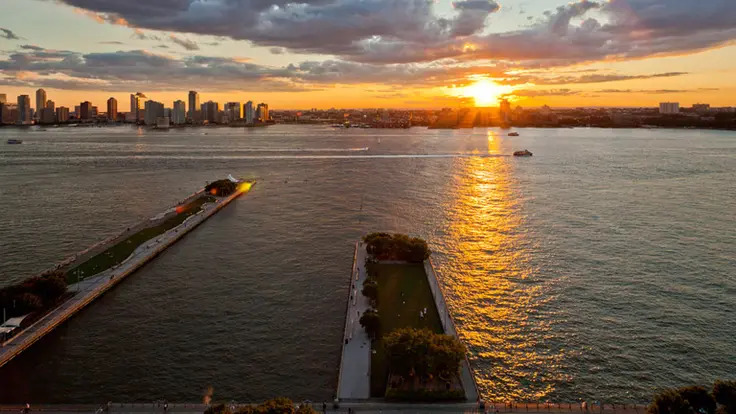 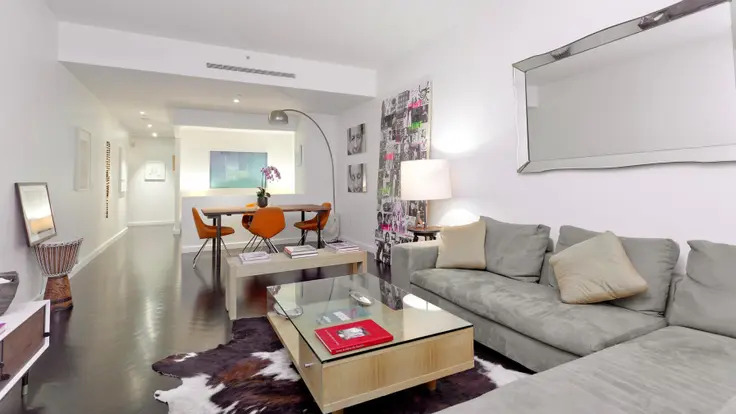 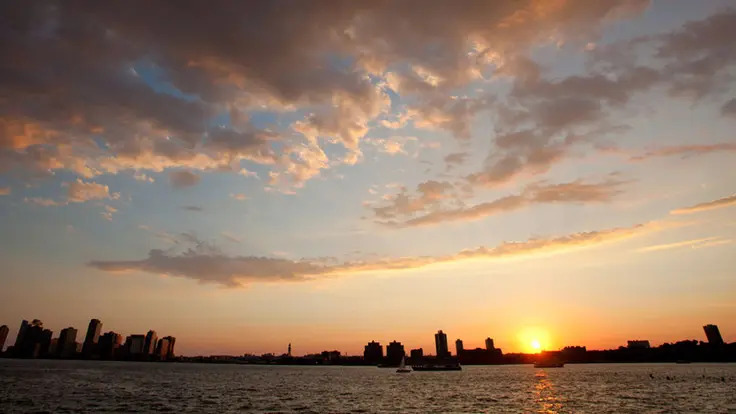 It is a very short walk from Hudson River Park, the High Line, and the Meatpacking District. 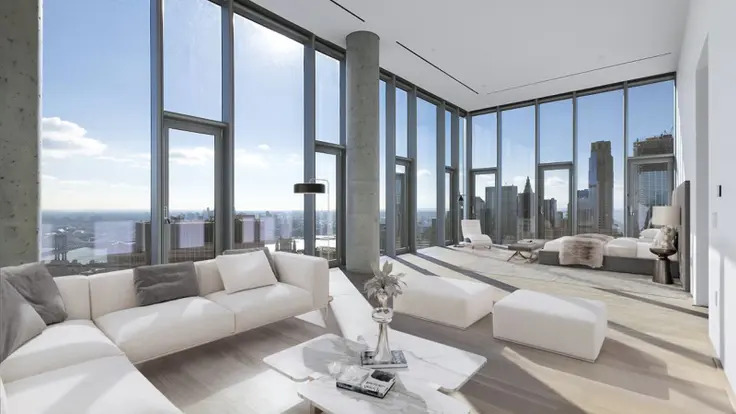 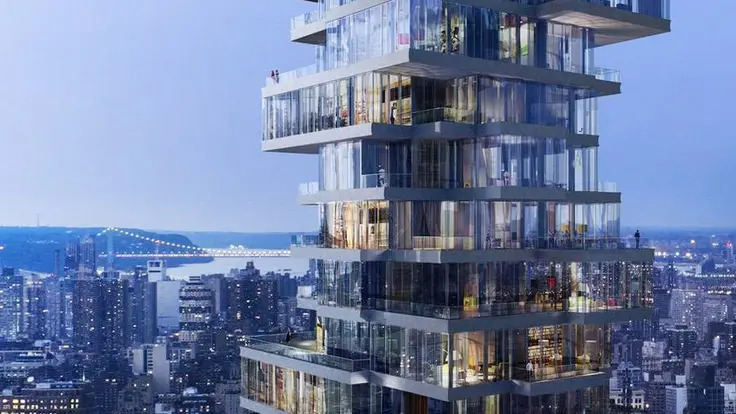 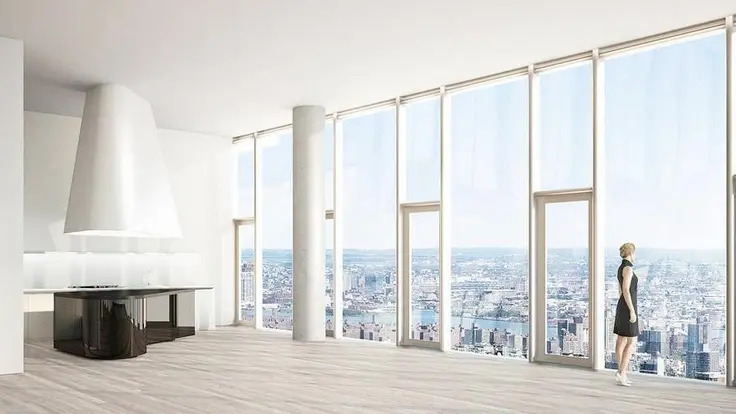 The 60-story residential condominium tower at 56 Leonard Street in TriBeCa was designed by Herzog & de Meuron. 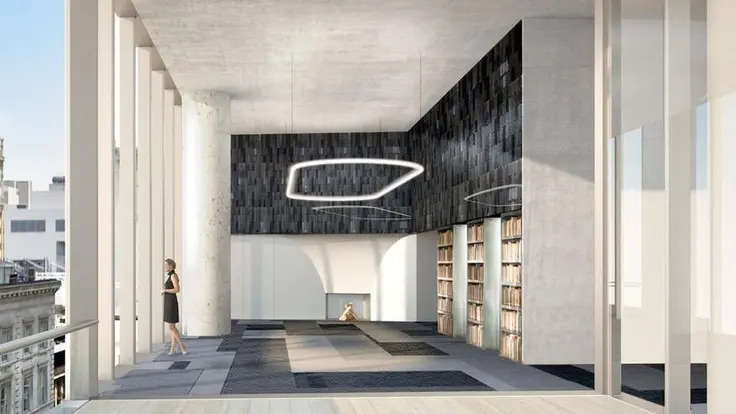 The striking design of the 145-unit building involves each floor being different and rotated from the floors above and below. 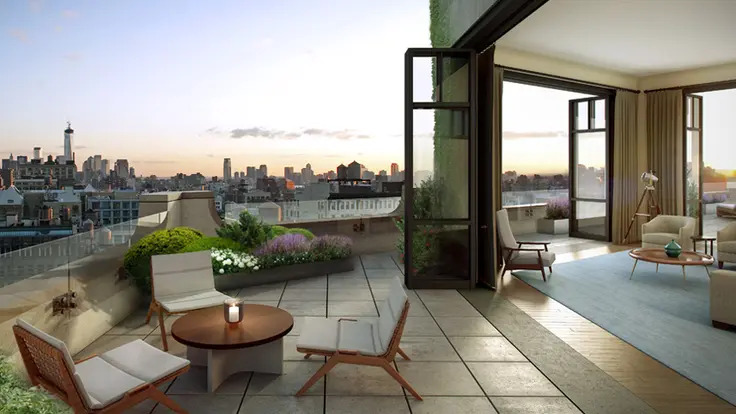 Each unit has a private balcony. 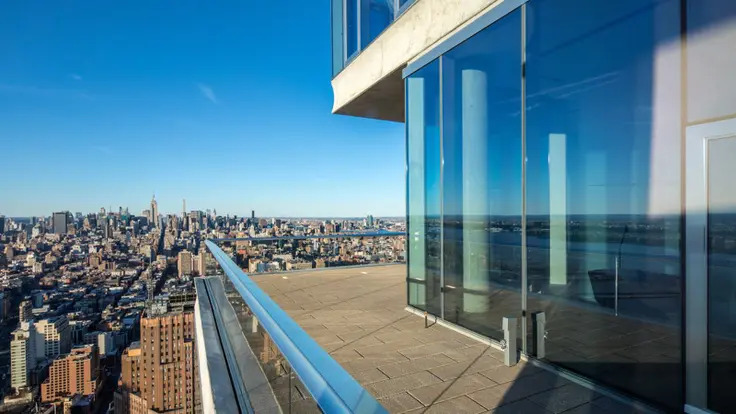 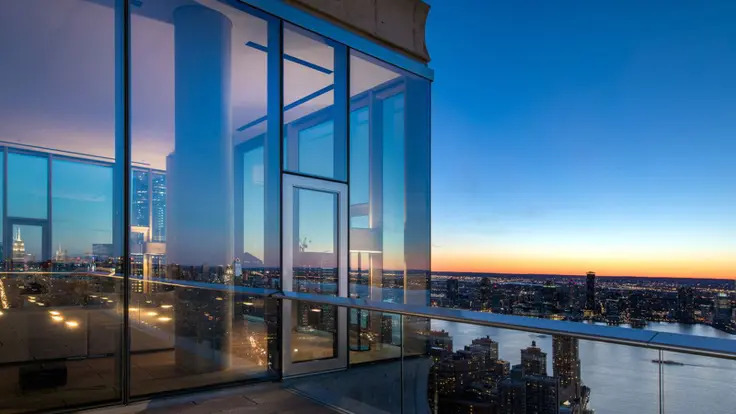 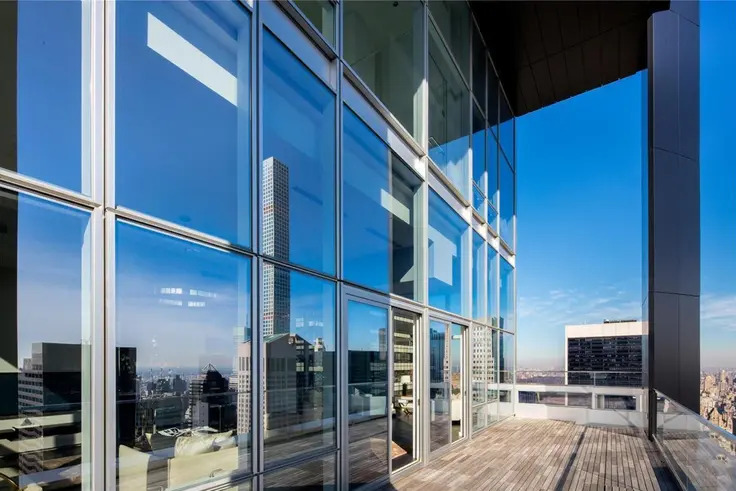 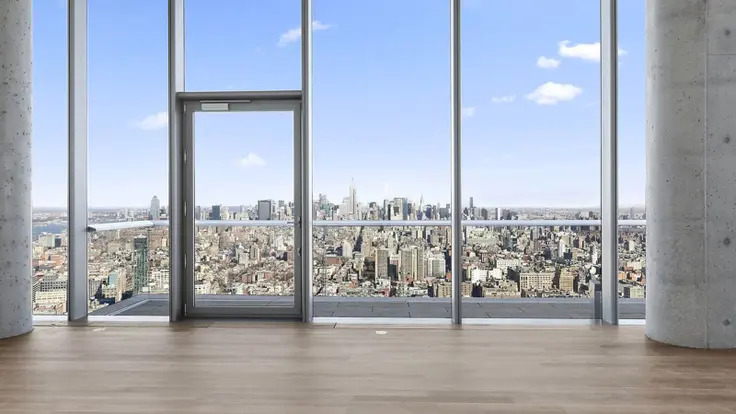 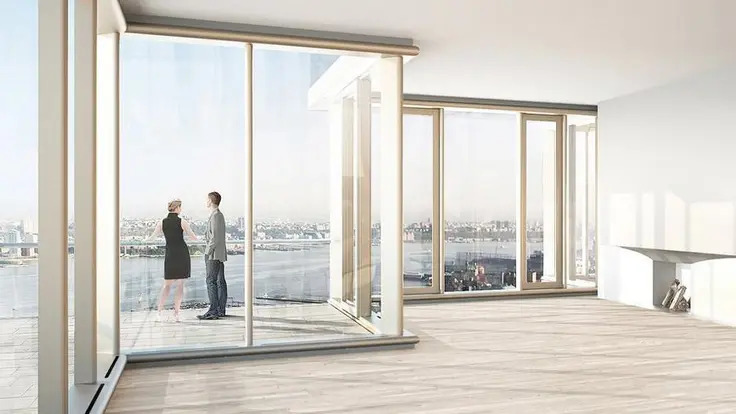 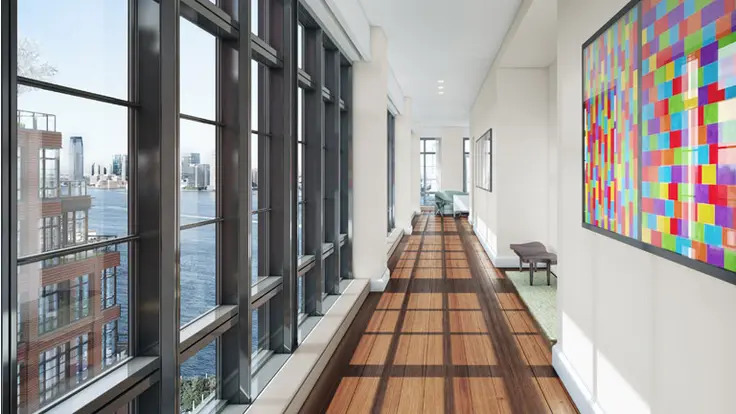 The floor-to-ceiling glass window walls in the condo offer generous views of the cityscape, water, bridges and beyond. 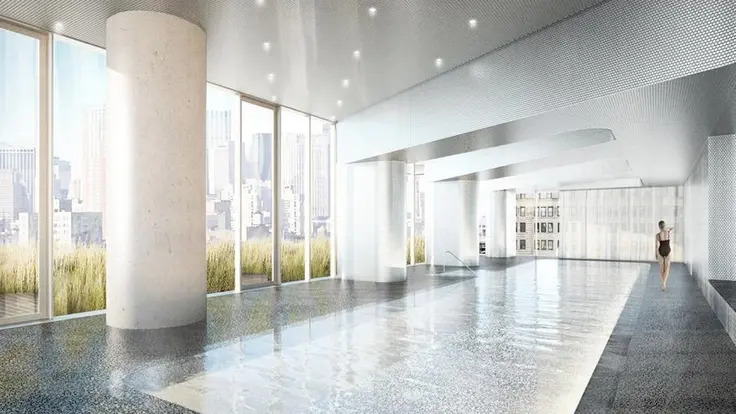 Two floors of amenities include a 75-foot infinity pool, a sundeck, a fitness center, a spa, a library lounge, a screening room, and a conference room. 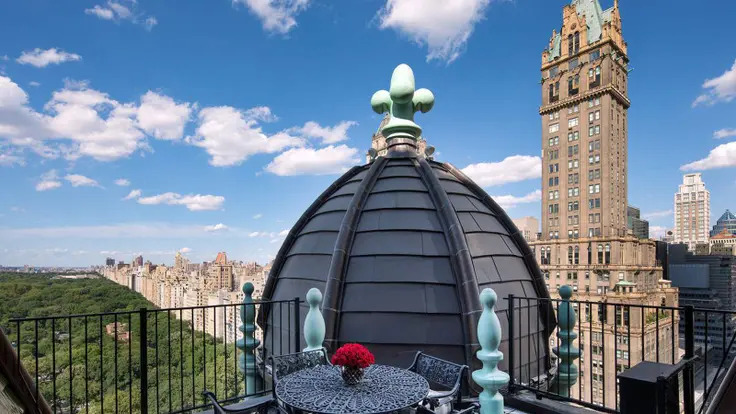 This 21-story apartment building was one of the first to be erected on Fifth Avenue after World War II. 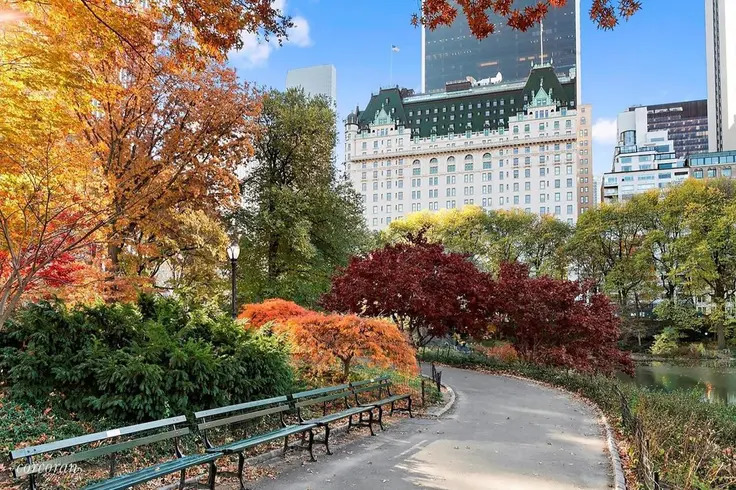 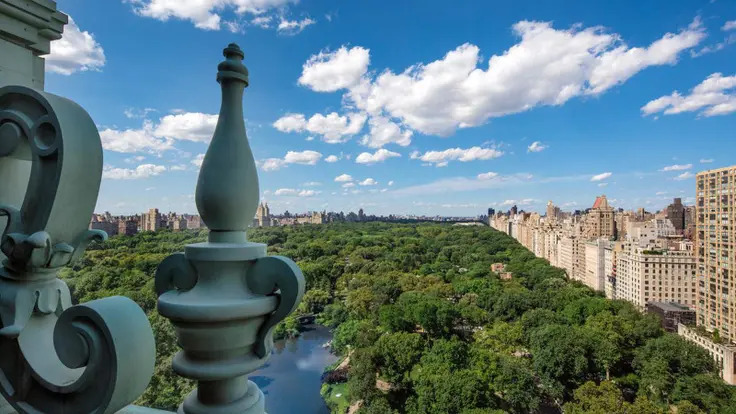 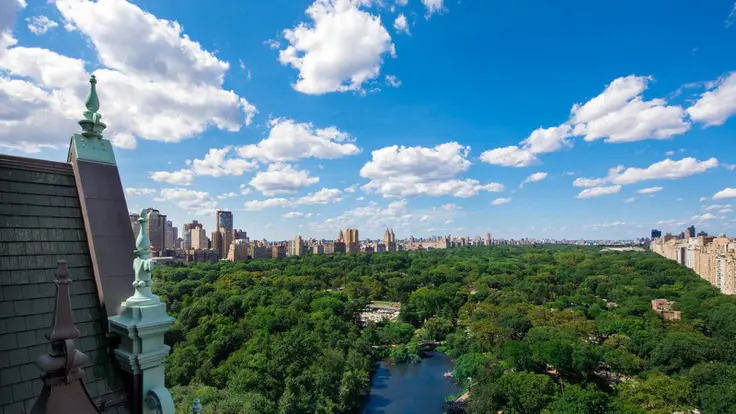 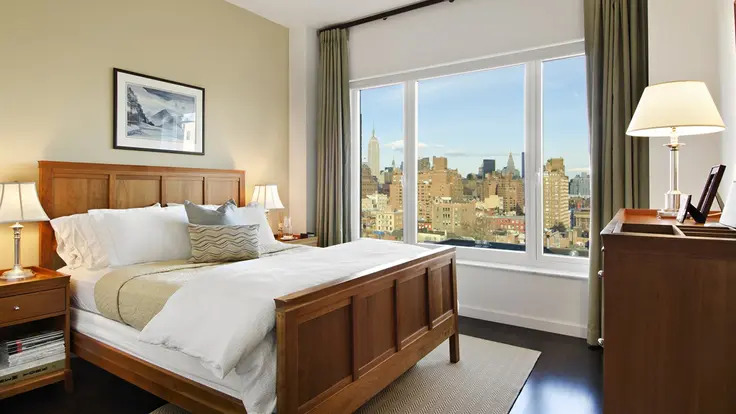 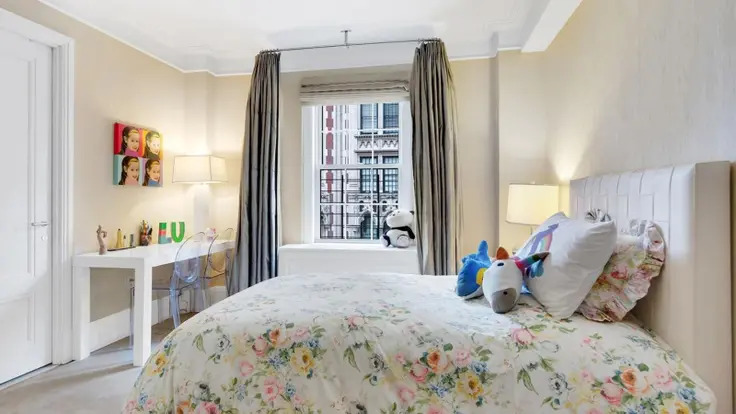 Across the park from the boat pond in Central Park, the building has a wonderful, highly desirable location and great views from many apartments. 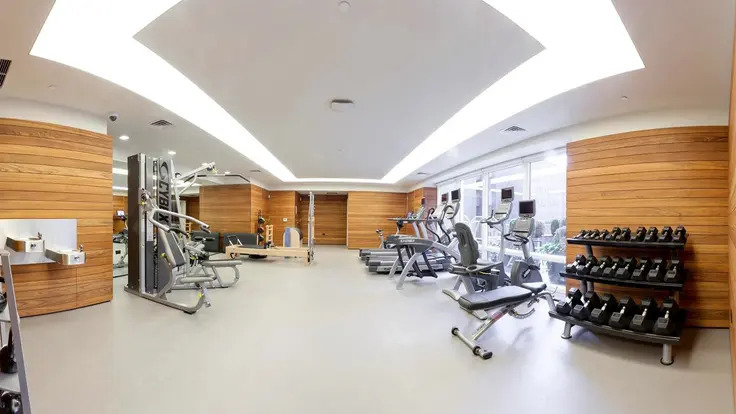 The 92-unit building, which was designed by S. L. Bien, was converted to a condominium in 1983. 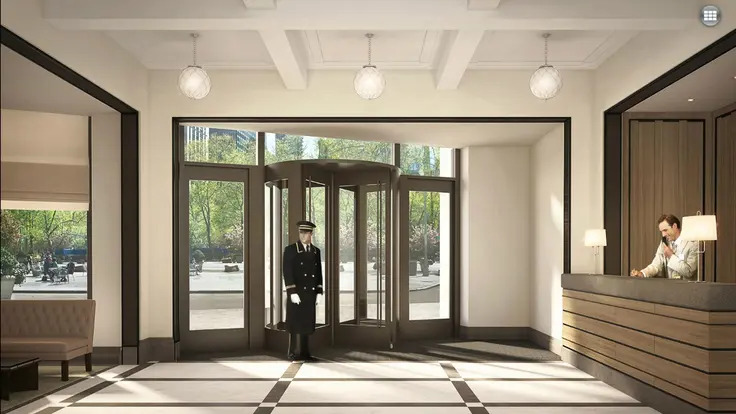 The building, which has a white-brick façade over a two-stone limestone base, has an elegant entrance, a sunken lobby, a doorman and elevator persons. 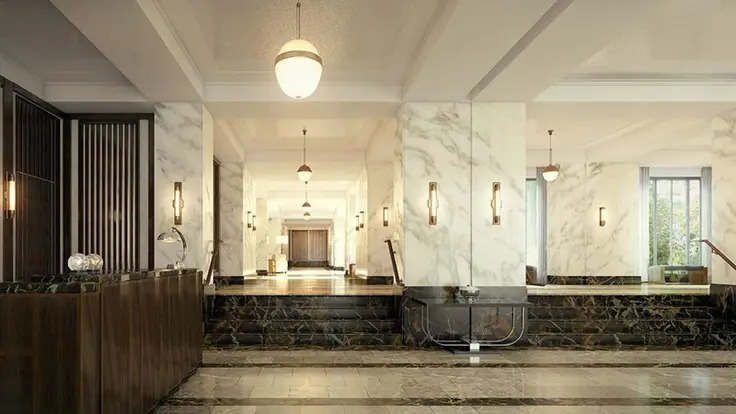 The building's lobby is very attractive with a marble floor and handsomely incised bronze elevator doors. 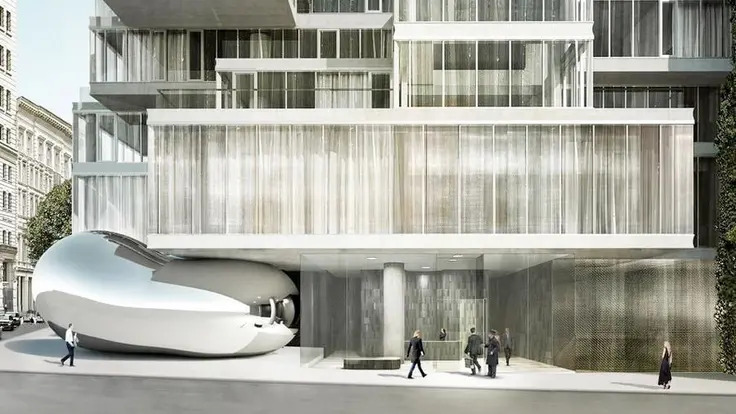 There are mail chutes on each floor. 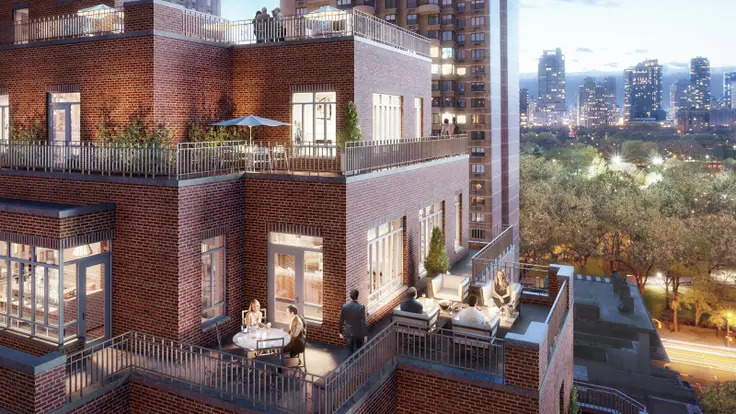 Over the years, many of the corner balconies on the avenue have been enclosed. 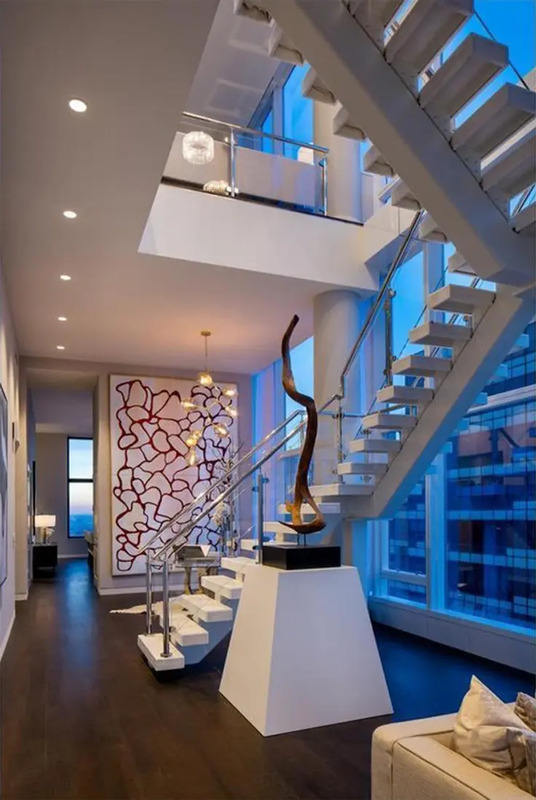 The balconies have attractively designed metal railings and the building has a garage. 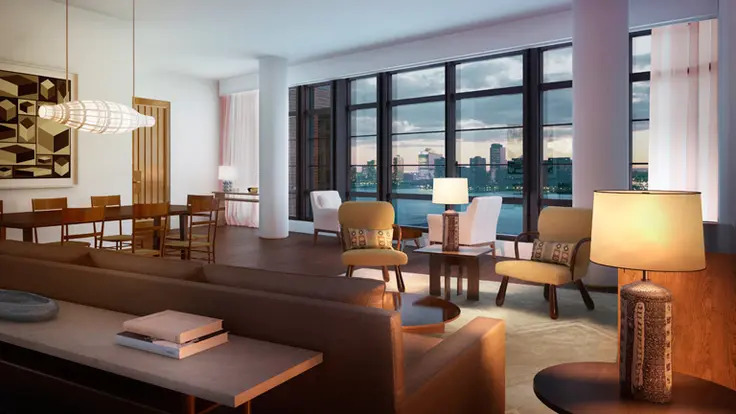 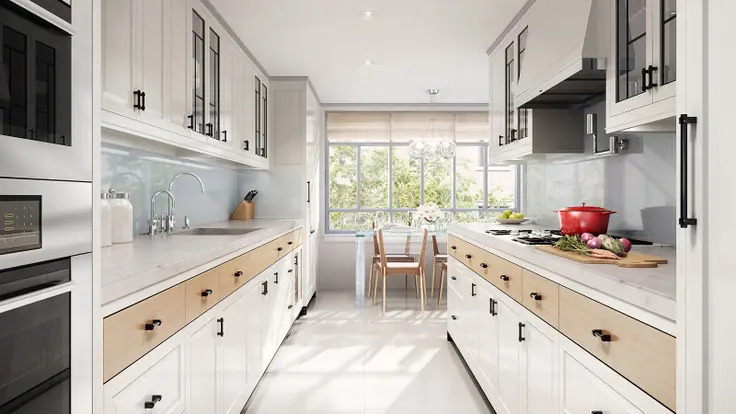 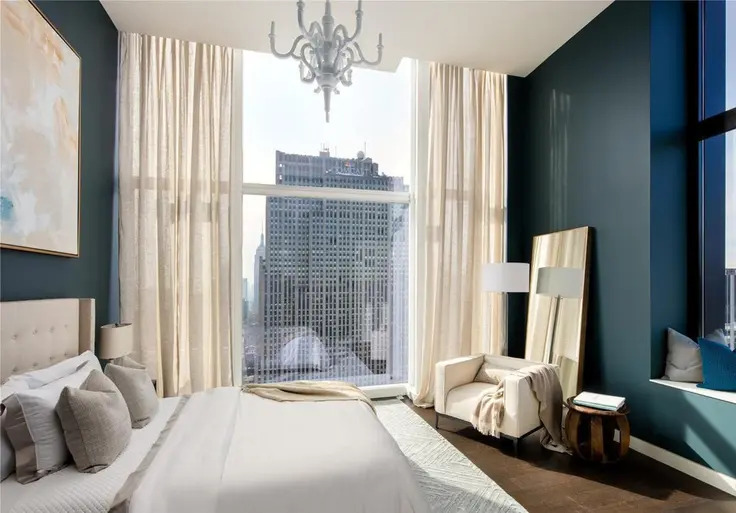 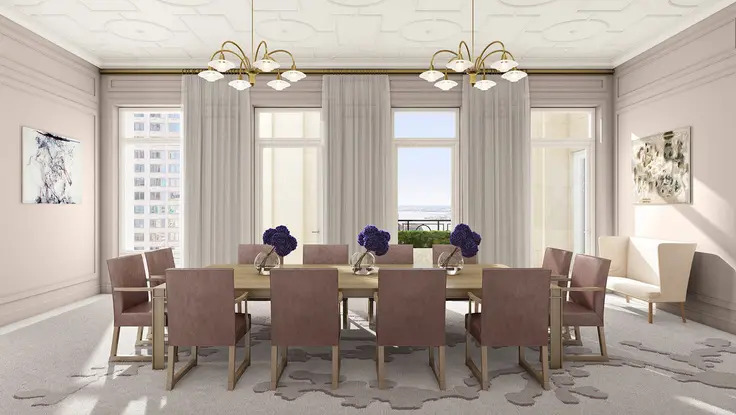 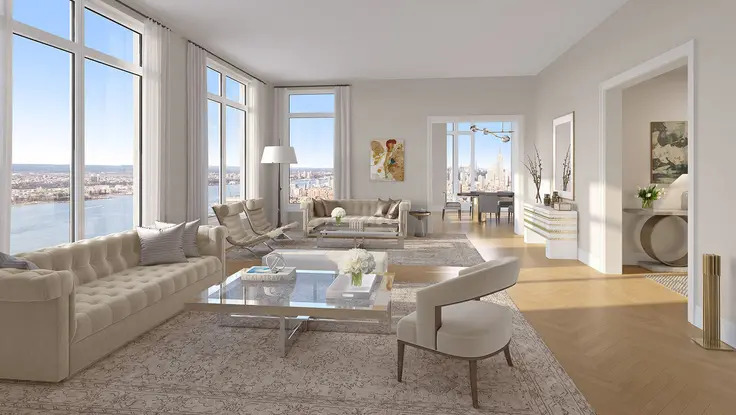 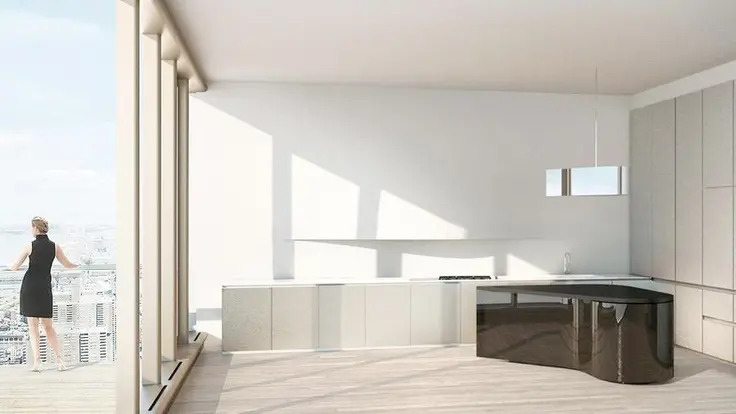 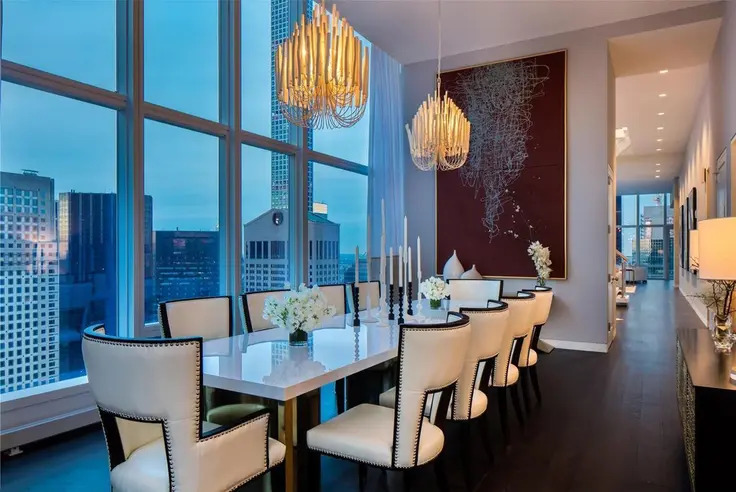 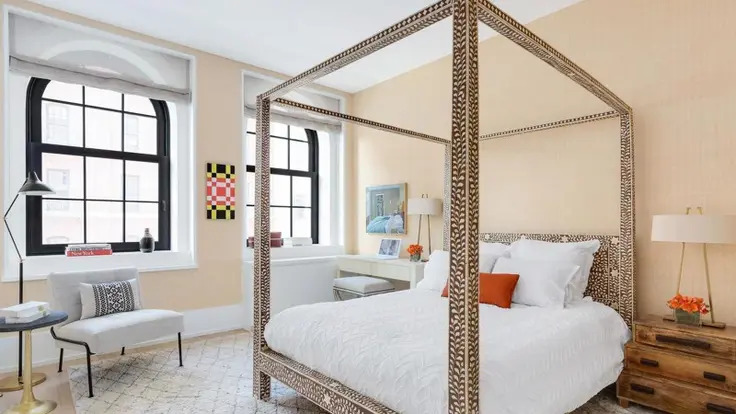 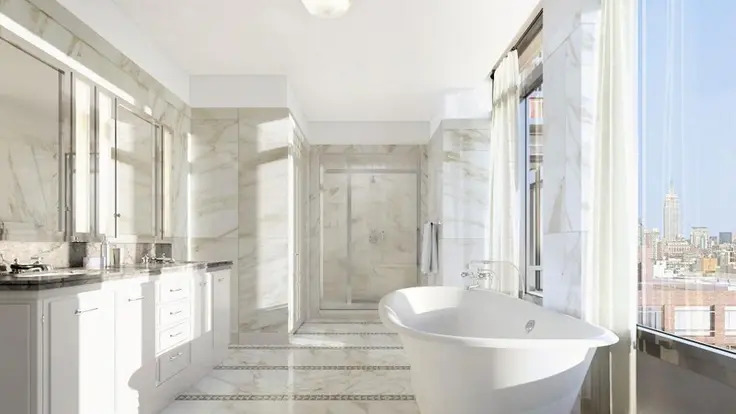 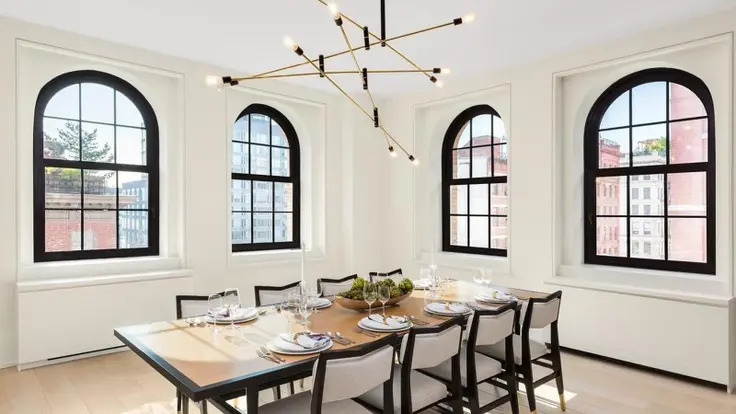 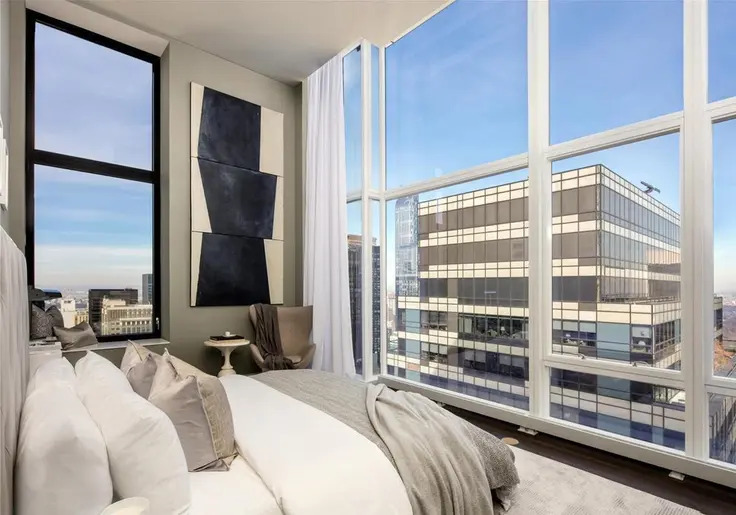 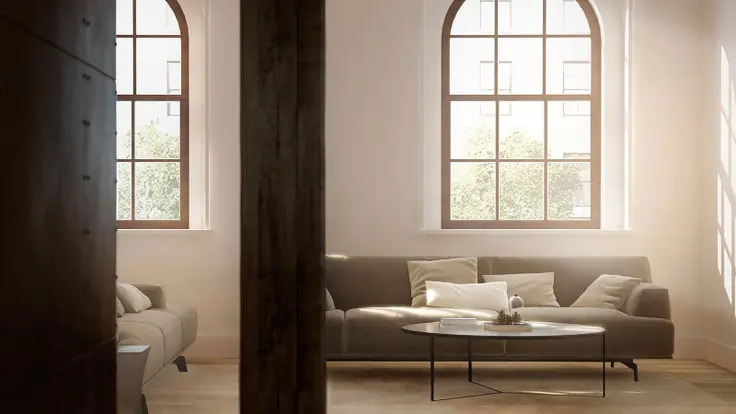 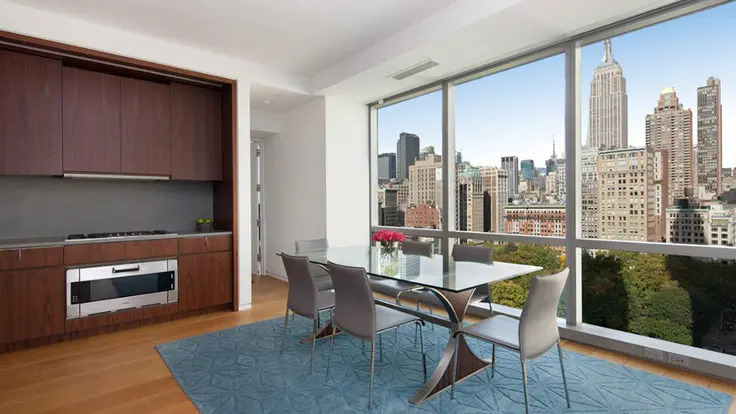 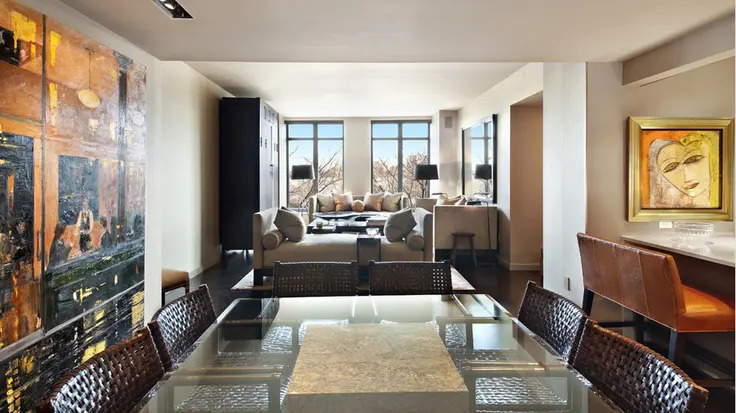 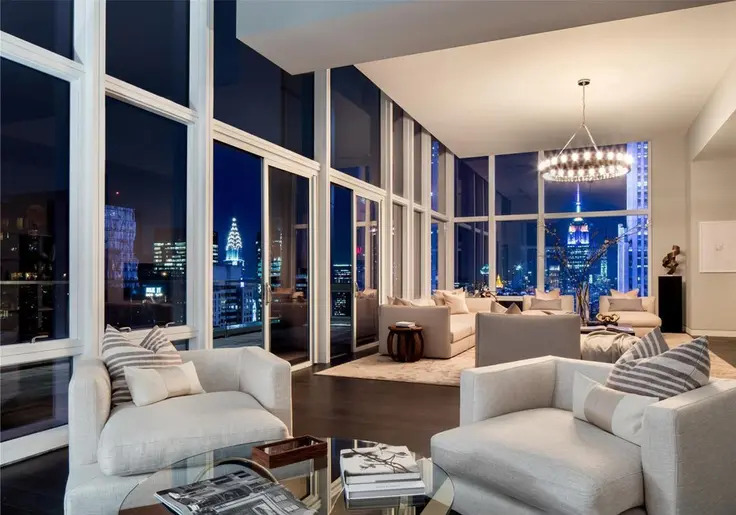 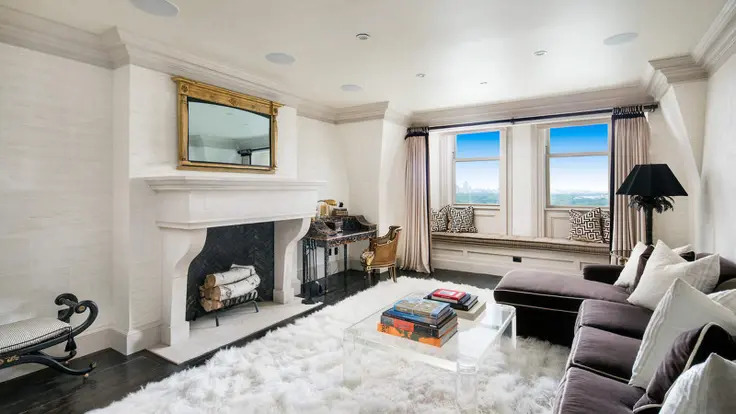 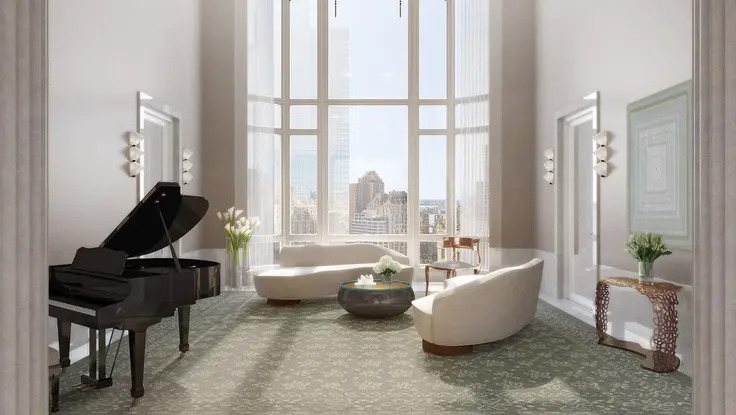 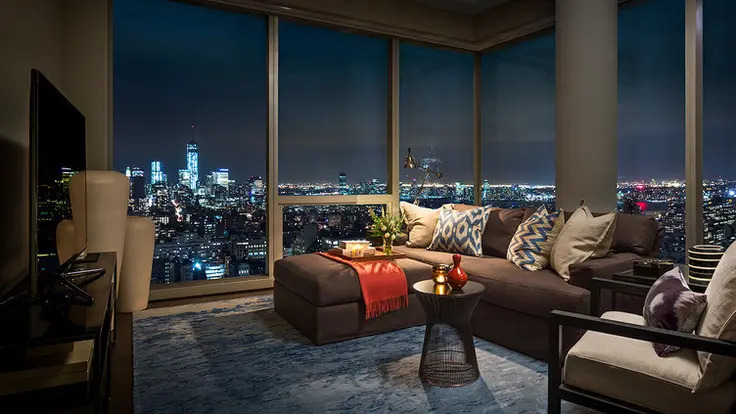 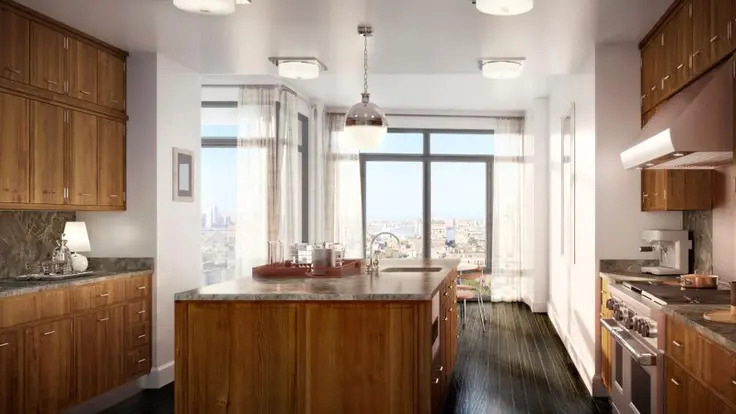 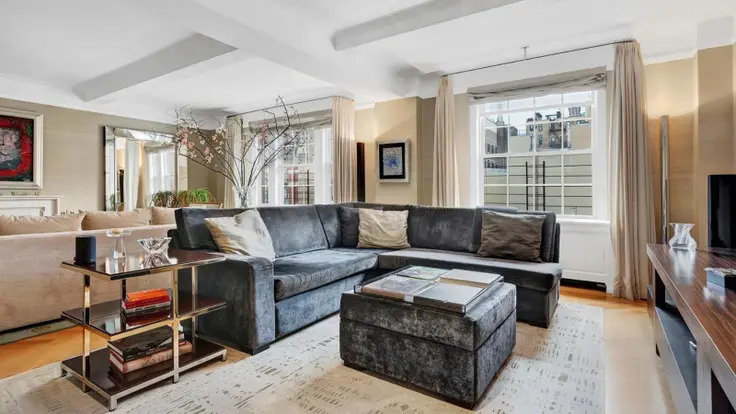 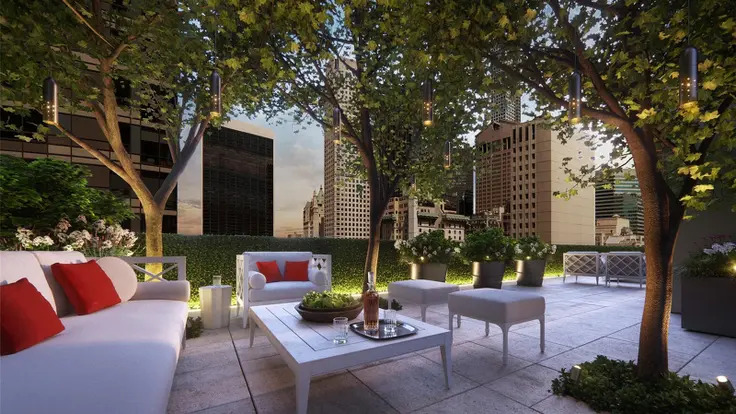 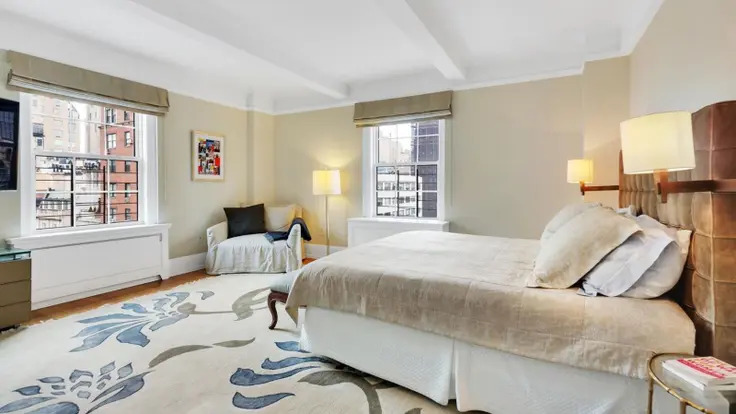 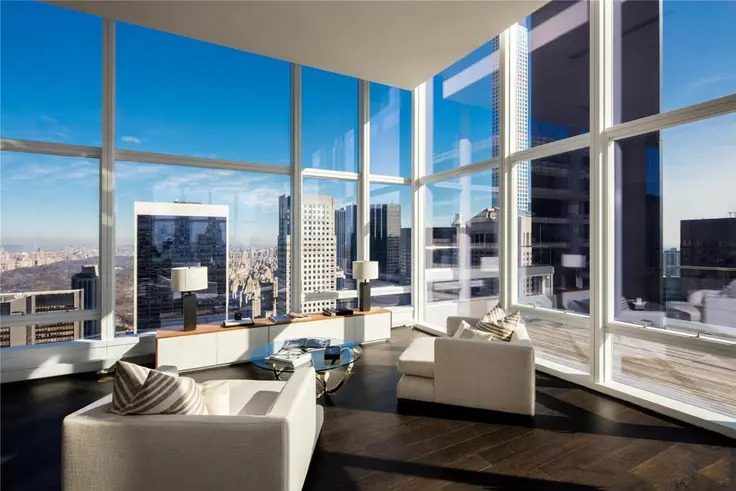 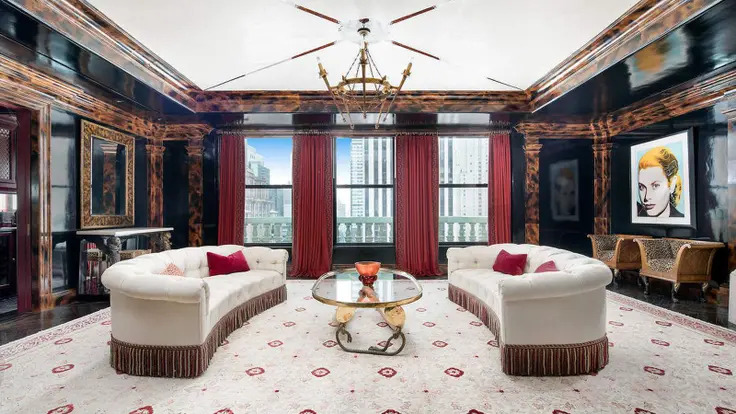 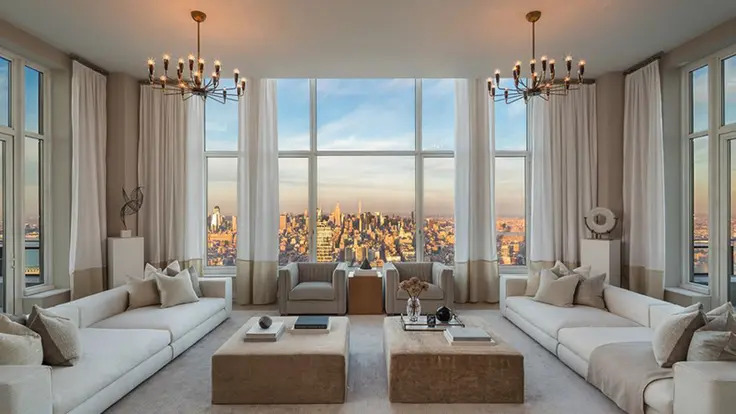 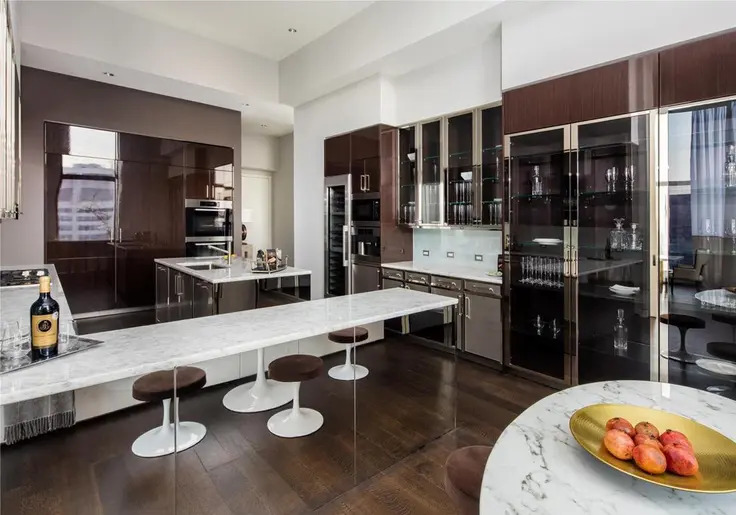 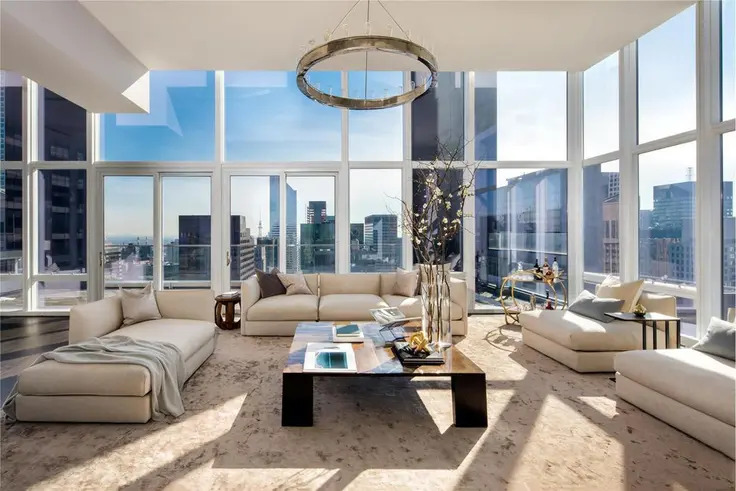 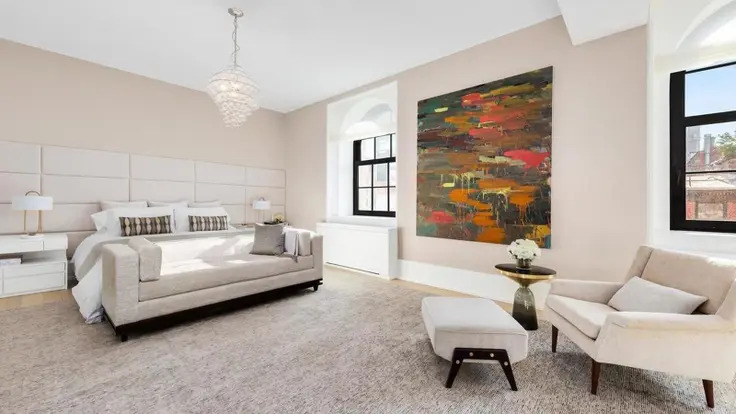 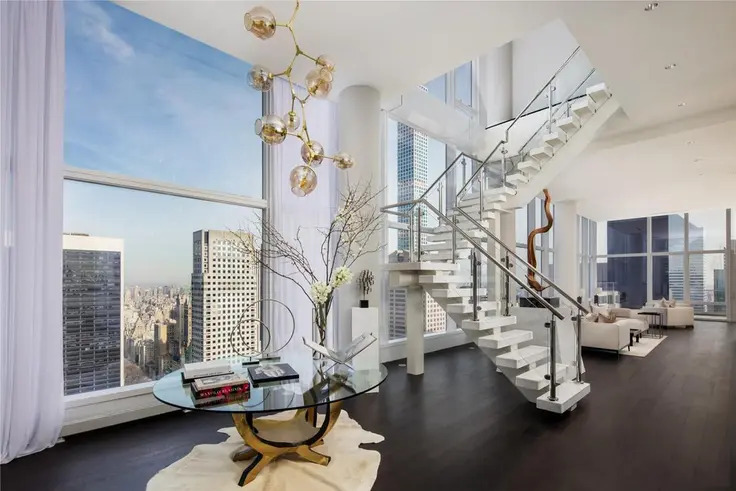 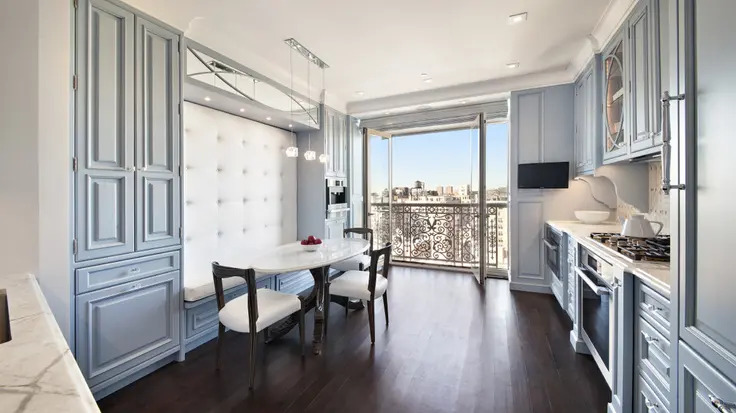 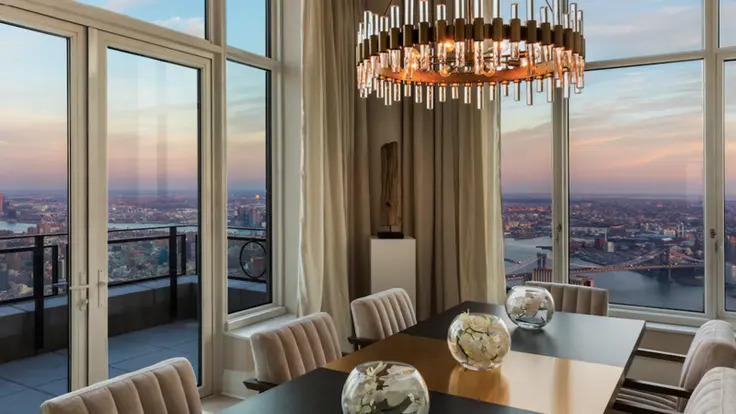 The condo conversion at 10 Madison Square West features 125 one- to five-bedroom residences with large windows, many overlooking Madison Square Park. 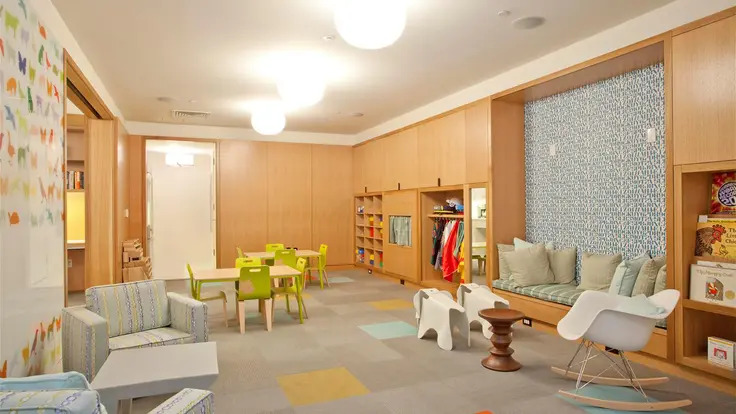 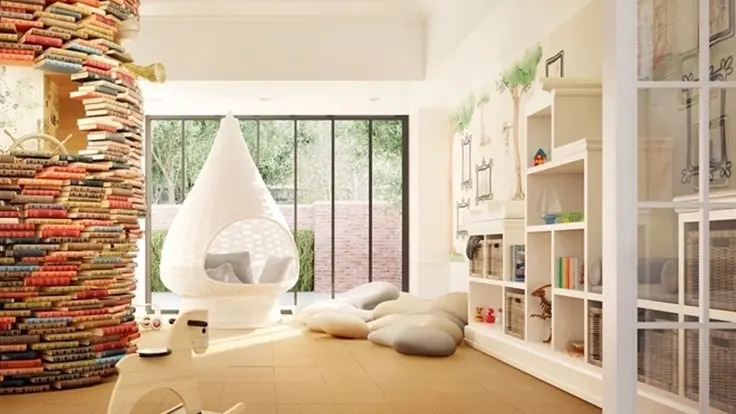 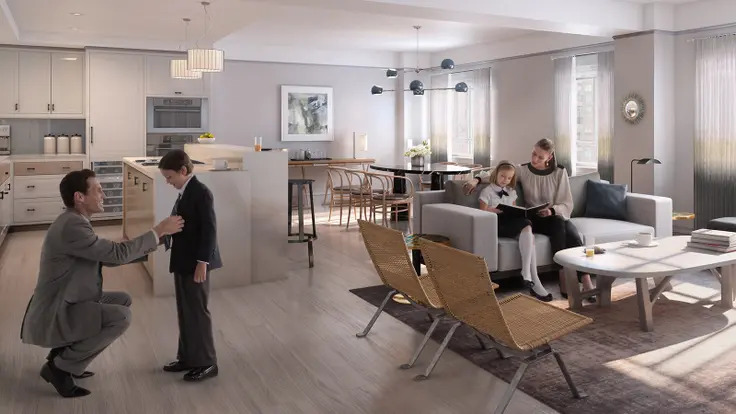 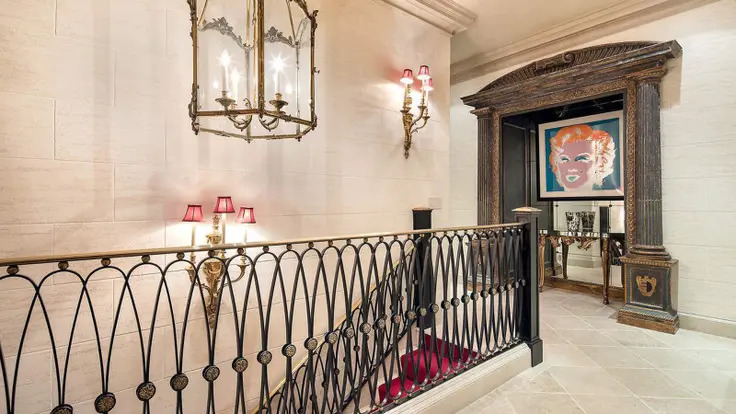 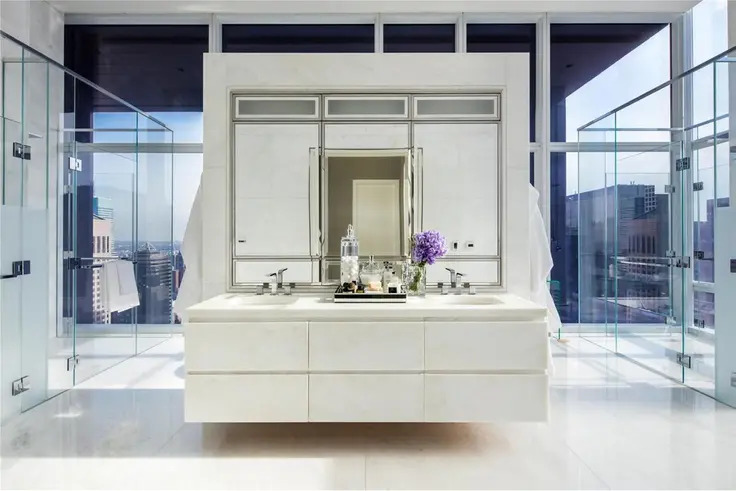 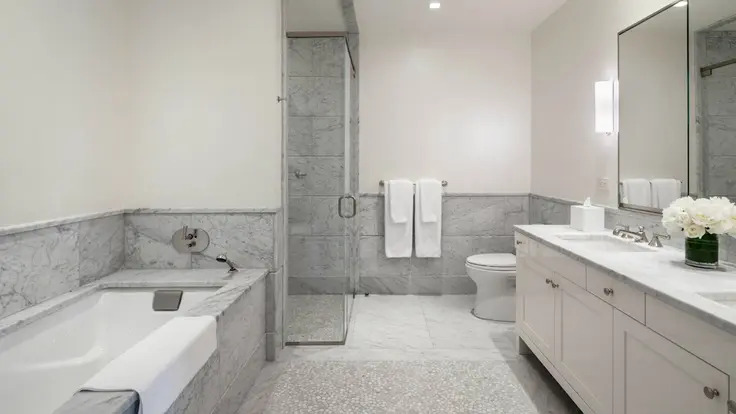 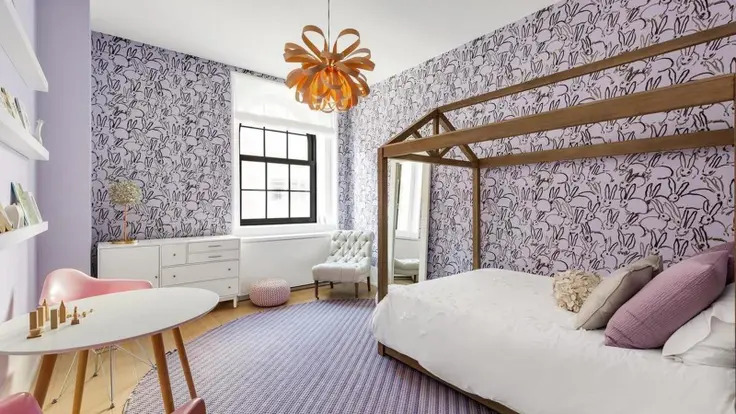 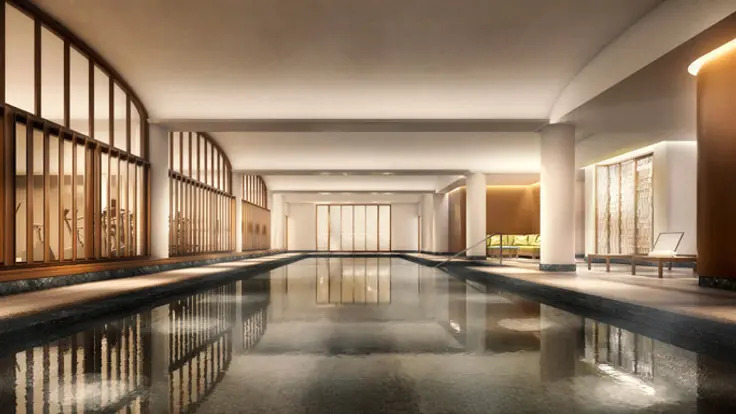 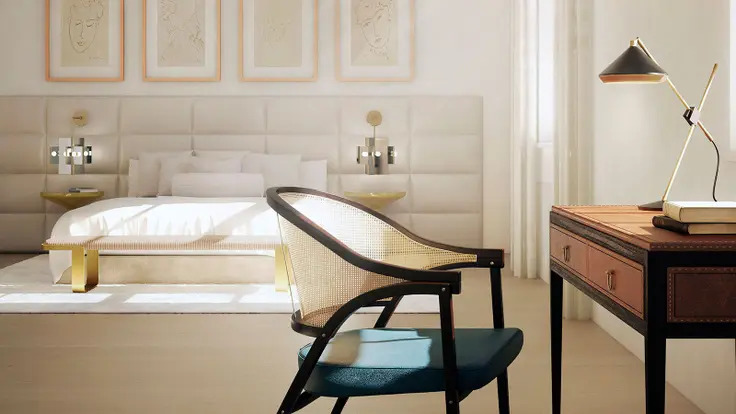 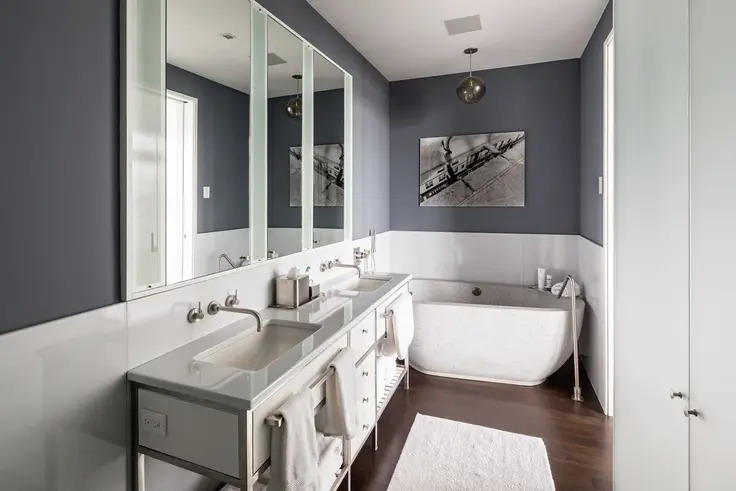 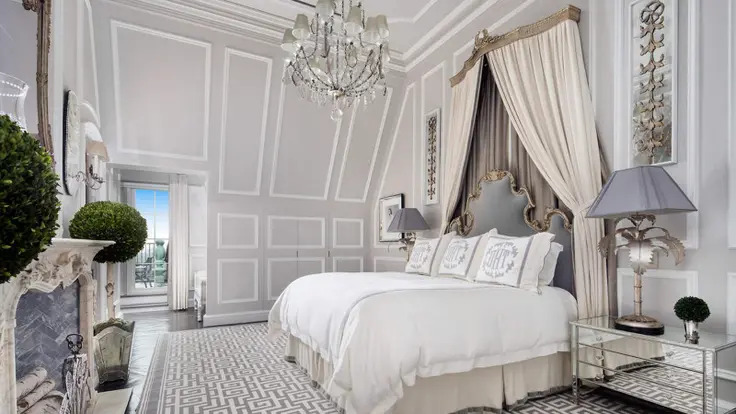 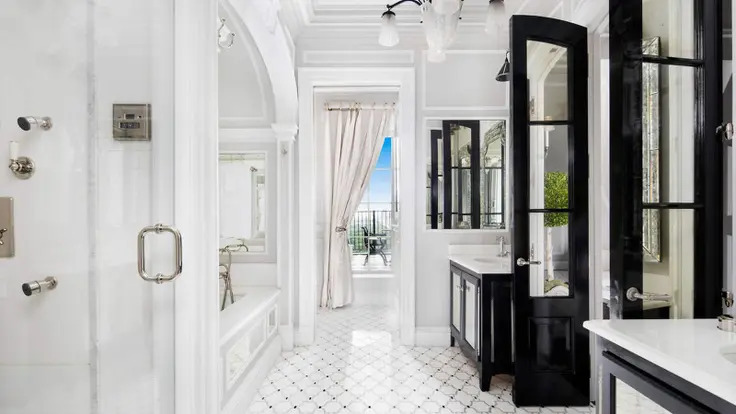 Amenities include a private residents’ club, fitness center, 60-foot lap pool, hot tub, yoga studio, Pilates studio, high energy studio, spa treatment room, children’s playroom, private storage, bike storage, courtyard garden, doorman, concierge, porter, and live-in resident manager. 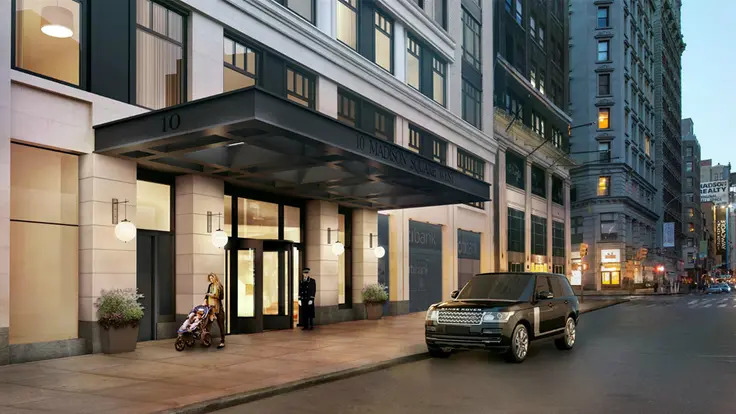 The building is within a couple of blocks of several subway lines and is one block away from Eataly. 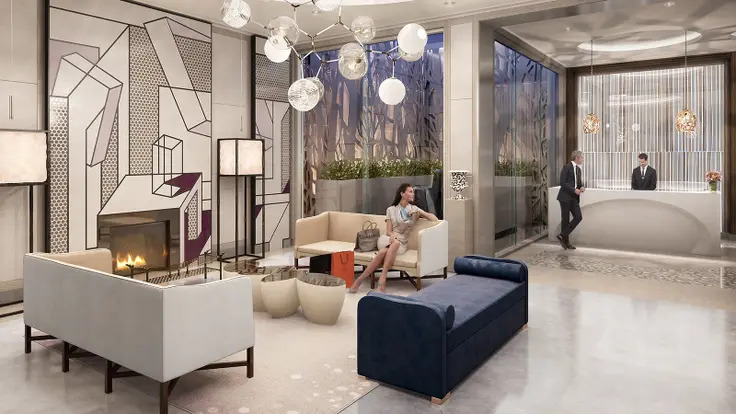 It is also convenient to the many shopping options on Ladies Mile, which include national retailers such as Sephora and Club Monoco.